Hello everyone! Welcome to my sewing room. Grab a cup of your favorite something and spend some time with me. I just love when friends drop by! I've done 2 other posts on my sewing room in the past. The first was when I first moved into my room after a very devastating flood in my basement and the second post was after a big clean up. Well, this post is about a clean up, a few furniture moves and it also includes links to a lot of the projects I've done on my Tool Time Tuesdays posts since the beginning. All words that are printed in red will be links to a tutorial post!! Remember I am a thrifty person and rarely, if ever, do I spend full price for any thing. I repurpose, paint and use thrift store finds in my sewing room. So if you think you can't have a sewing room or a craft space, just look around your home and I'm sure you'll find things to paint and put together to make a great work area. So here is the room all cleaned up and a few tables moved around. Seeing that this is where it came from, I'm sure it won't take me long to go back. Seriously, it was worse in person. For some reason, I work well like this! This frightful picture is in the middle of moving things in and out and changing things around. It definitely gets bad before it gets better when you're moving stuff. Ok, now we are all back together, let's start in one section of the room and work our way around. This wall holds all my crafting and sewing supplies. The boxes are Sterilite plastic shoe boxes from Walmart...98 cents. I have been collecting those for years. I always buy white so they will always match over time. Each one is label in the front. To the left of that cabinet is my Vertical Coffee Can project. I originally made that for spray paint cans, but now I use it for all my strings. Click here for that. I hot glued a tape measure on one side to measure out the correct length for a project. The handle at the top holds the scissors to cut the string. This chair is so old...over 15 years I think. It's great for my husband or the girls when they come in for a visit or just to sit when I'm do some hand sewing. 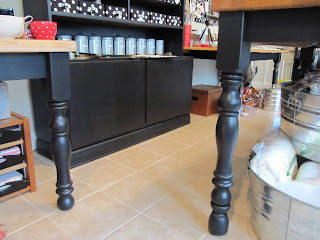 The small table on the side is also a redo which you can see over at this post. Here's a little peek under the chair's skirt. 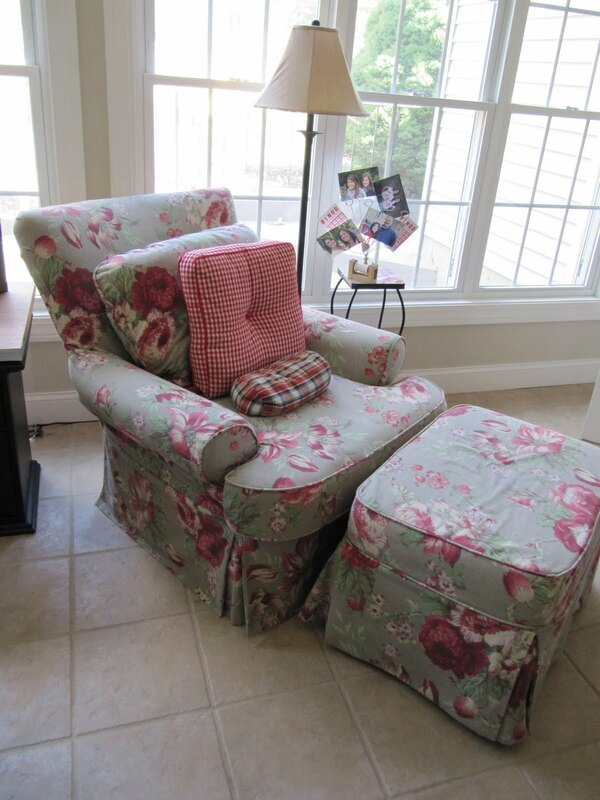 You can turn any piece of furniture into a beauty with slip covers. We got rid of the family office space now that the girls are both in college, so I moved all the house paper work and such to my office in my sewing room. Now I really need to be organized with this desk. 2 old window frames with cork in one and calendars in the other keep all the important info right there in front of me. Here is the post for this project. Can't forget the jumbo button wall decoration above my desk. That post was so popular. This is made from a cheese board! A 25 cent thrift store find hangs on one of the legs to hold all my reading glasses! A file for important papers right where I can find them. The spike paper holder keeps little notes that I jot down very organized. 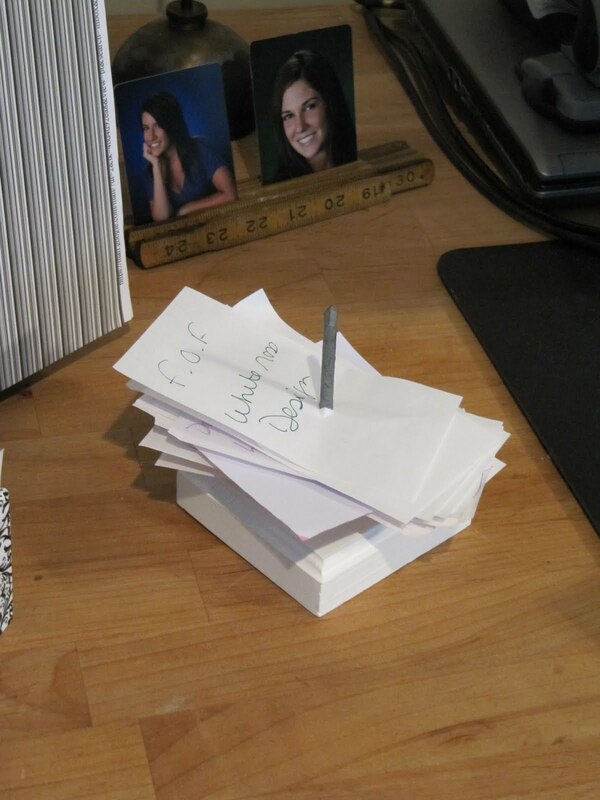 Here's that tutorial for the spike paper holder. My grandfather's old ruler and oil can are great picture holders for decoration. Just twist up a piece of wire and stick it in the oil can to hold your picture. On the right side of my desk is a double side picture frame. One side is a picture and the other holds all my user names and passwords. See this post for that tutorial. I have 2 daughters who have grown up way too fast, but I keep their old Slinky's to remind me when they were little. I keep my most important "To Do" notes in there. I miss my girls something awful! Now going under my desk...every square inch of space is important. 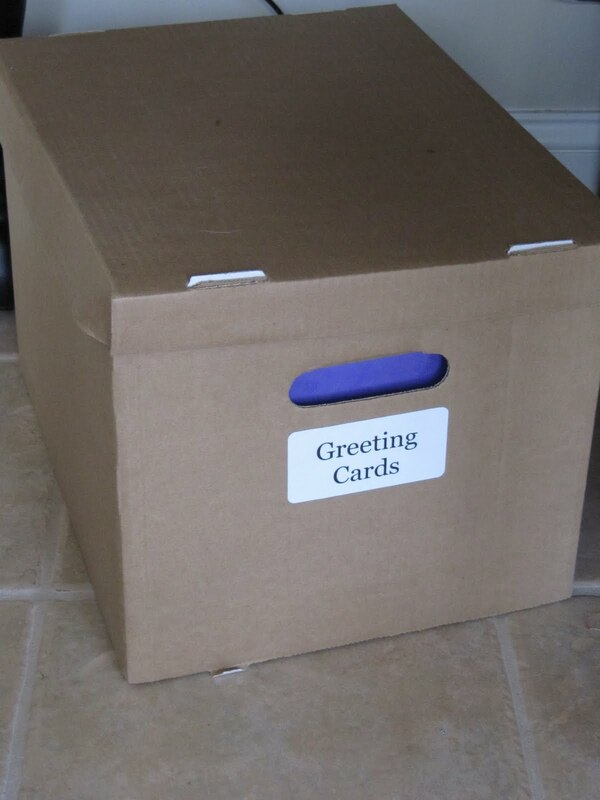 This file box holds greeting cards. 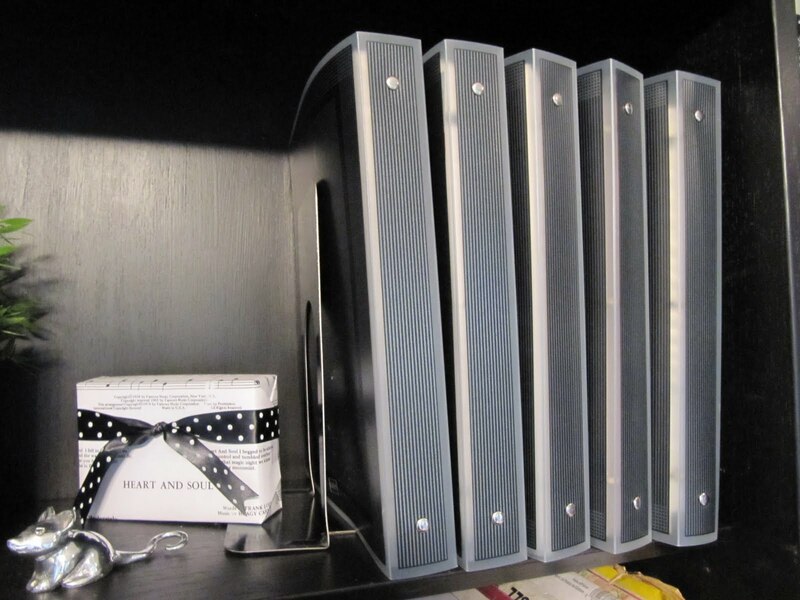 These cheapo office boxes are the perfect size for hanging files. 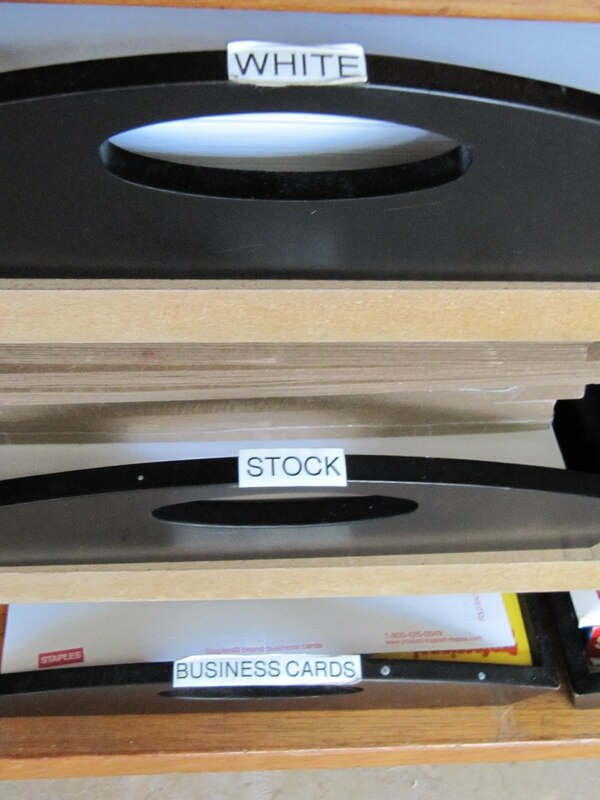 Who needs a file cabinet when a cardboard box works just as well. Still underneath the desk...this is an old TV stand that I added 2 shelves to. The black trays were in a clearance section in Staples office supply. They hold all my different papers for the printer. This was a very old china cabinet not being used in the basement. A coat of black paint, glass doors taken off and crown molding added. All the crap up on top...decorative plastic grocery bags, but filled with stuff. These magazine holders have all the computer and printer information and instructions. 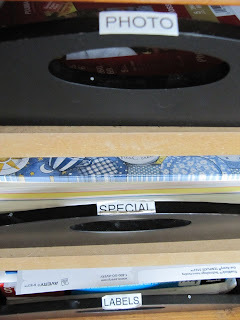 The magazine holders are made from cereal boxes...tutorial here. The handles for them are Pipe Straps found in the electrical section of the hardware store. 3 ring binders hold all my patterns and inspiration pictures. 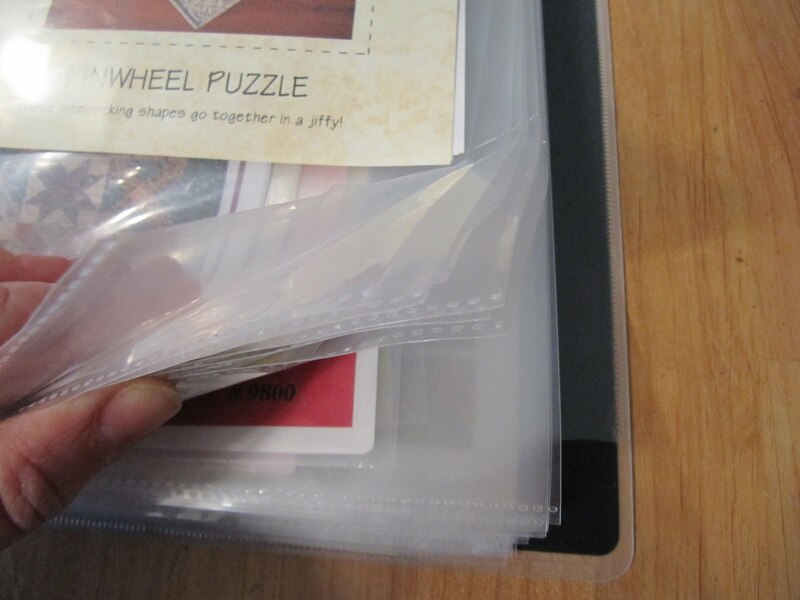 This binder is filled with those plastic sheet protectors. All the pages neatly protected and you can easily see all your patterns or important papers. Each pattern just loads in from the top. See here for a guest post that I did with a lot more tips. These boxes hold so much too. These boxes are Propel water boxes. I just glued strips of fabric on the outside of the box and used the pipe straps again for the handles. 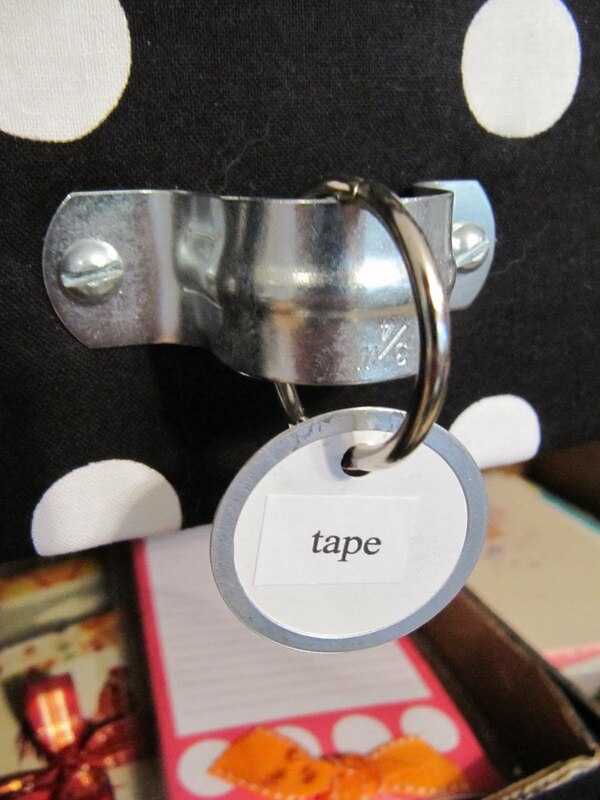 Holds tape and so many other office and craft supplies. 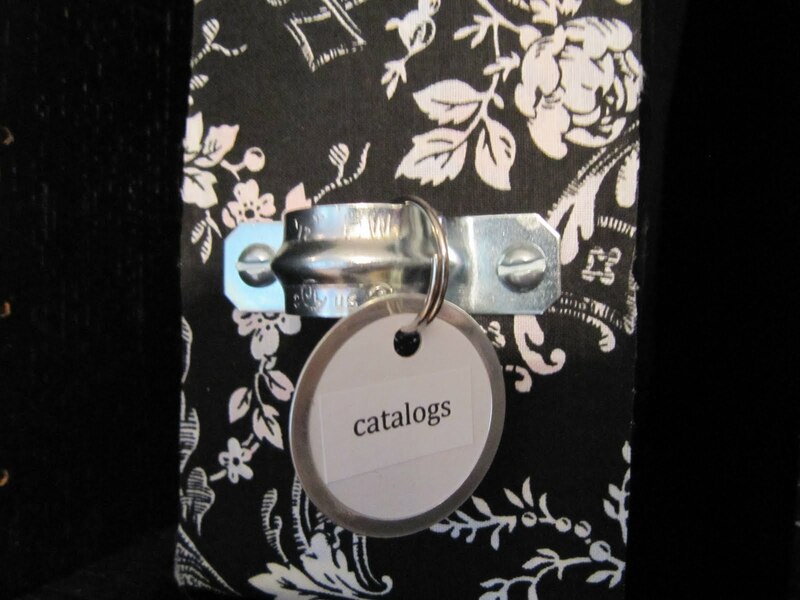 Hang tags dangle from a key ring. Next section of the room is my crafting table. 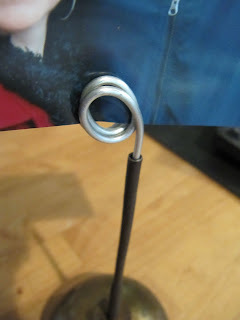 glue gun plugs into surge bar with lamp attached. If the lamp is on...that is your signal that you left your hot glue gun on!...click here for that. Old wooden boxes are label with a galvanized Light Switch plate. Just screw it into the box for a cute label plate. 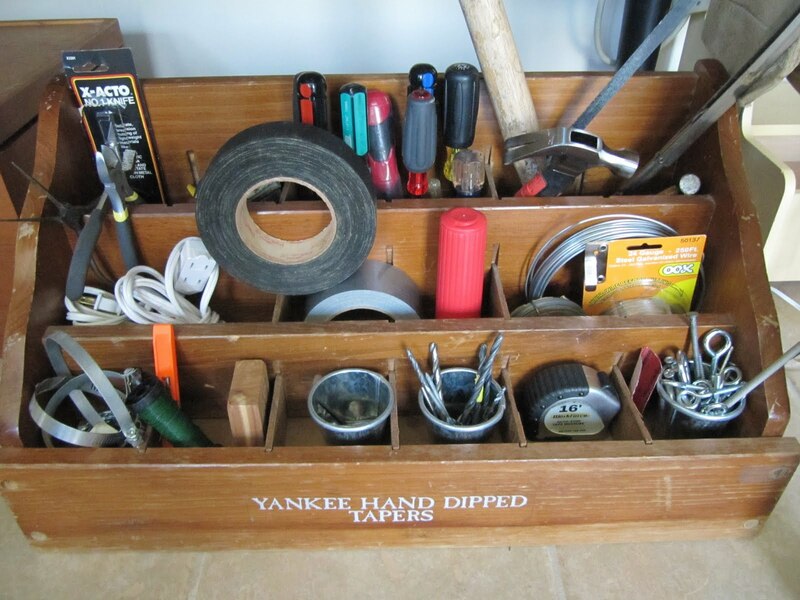 An old thrift store find is now my tool box. This wall unit is 3 old cheapo laminate book shelves, painted, thin paneling removed and bead board added to the back for support and crown molding added to the top. Seriously...crown molding and paint can turn junk into a jewel. These are just tension rods in one of the shelf sections. All my ribbon is stored here. Easy peasy! 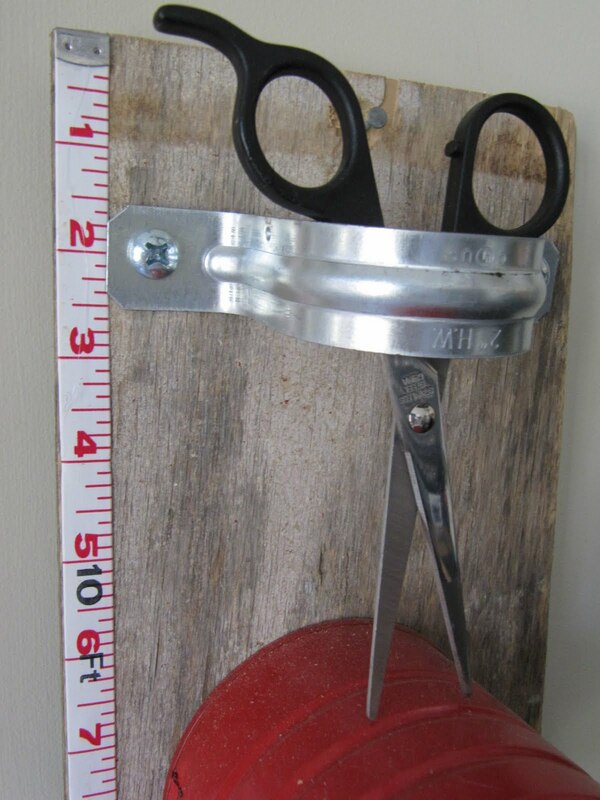 There is a yard stick attached to the shelf and scissors tied on with a ribbon, so they are always there. 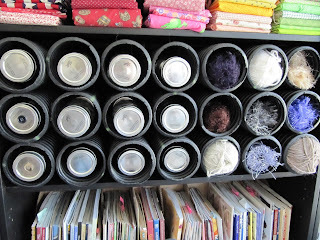 There is an update on how I store my fabric. This picture shows them stored in stacks in the wall unit. Due to too much sunlight and fading, I have switched to a new system. 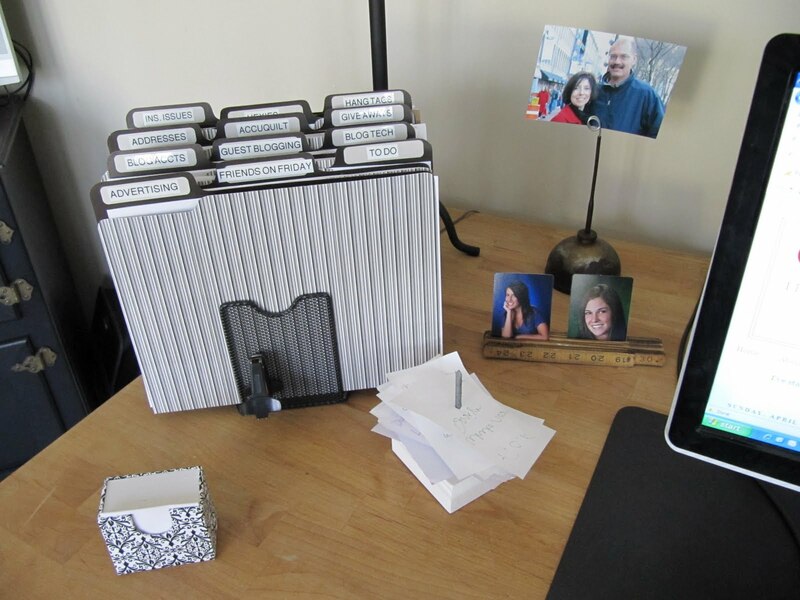 Still working on completing all the filing, but CLICK HERE to see my new system!! This was a popular post too. 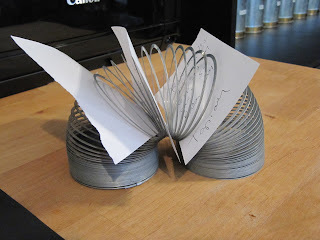 Remember the French Drains I cut up to store all my canning jars of button and my skeins of yarn...click here for that. 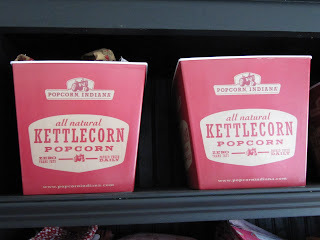 Plastic popcorn buckets are a cute way to store fabric and scraps! 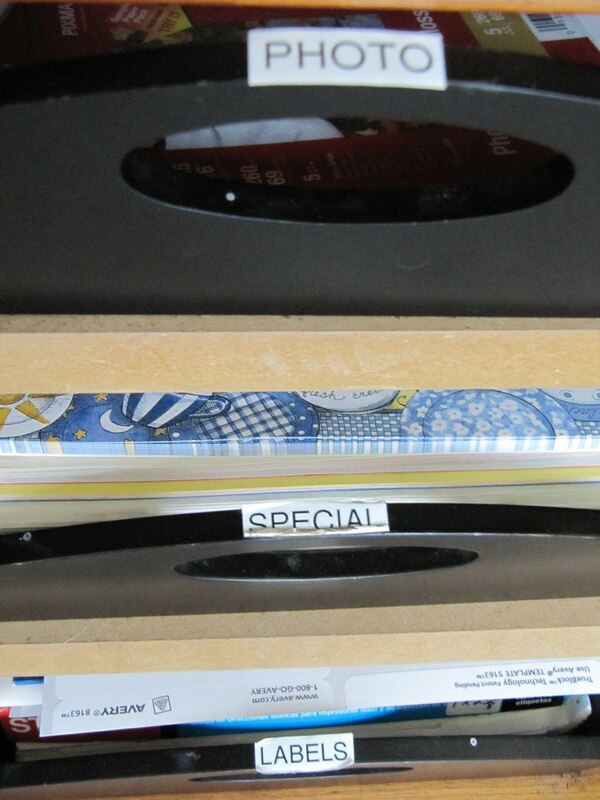 Wooden plate racks can hold quilting rulers or your accu quilt cutters. Here is my mom's old pot rack. 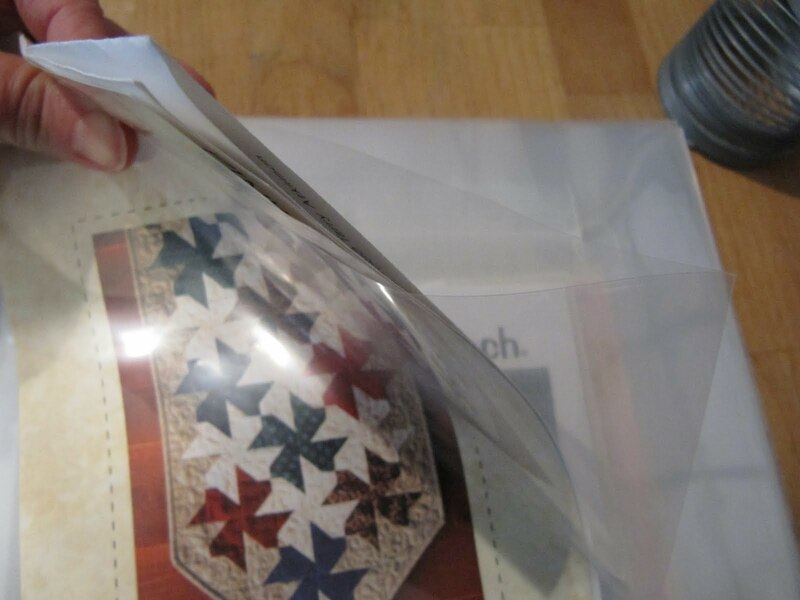 Keeps my old quilt collection and miscellaneous projects close at hand. Having an electric pot in my sewing room is great too. Boils water in just a few seconds. This is an old toothbrush holder for my small gadgets next to my machine. The pin holder is from the automotive store. It a magnetic car parts holder, but great for pins. An old tool box holds all my thread. Golf tees with flower glued on top will keep the matching bobbin with the right spool of thread. Also don't forget the little hair scrunchy that keeps your bobbin from unwinding. 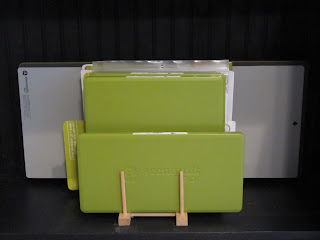 This stand is from the office supply. Holds paper while you're typing...but for me it holds pattern instructions when I'm sewing. I think I might put them on the edge of my sewing table. 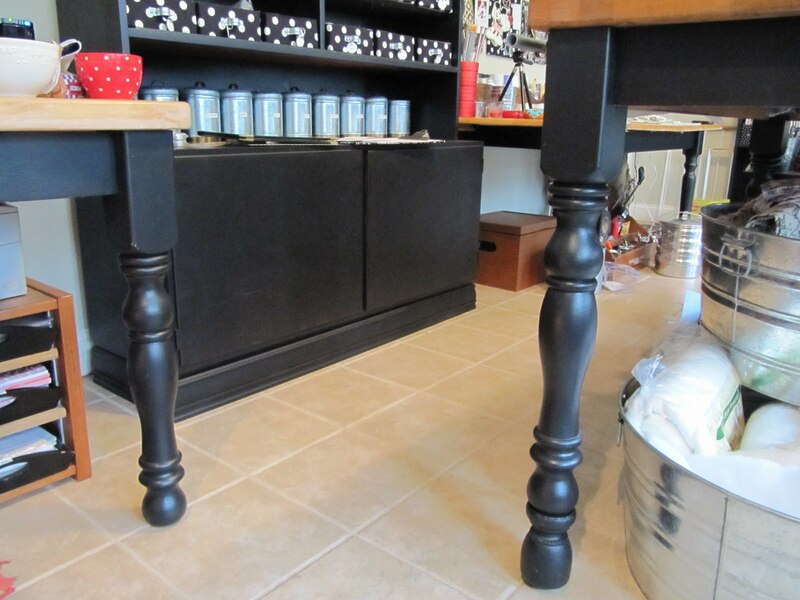 Here's a little small desk painted black to match. An extra spot when the girls are in here sewing with me. The cutting table is elevated higher than the other 2 tables, for ease of cutting...you don't have to bend over as much. 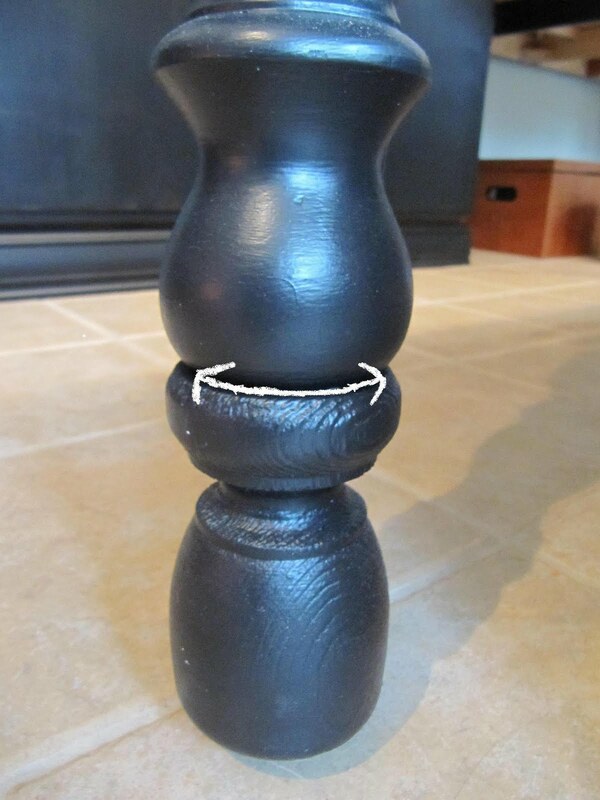 Just add finials to the bottom of your legs. See the white line I added so you can see the extra piece that makes the table higher. You can also use the plastic bed risers that you can buy in Walmart for $8.00 for a set of 4. 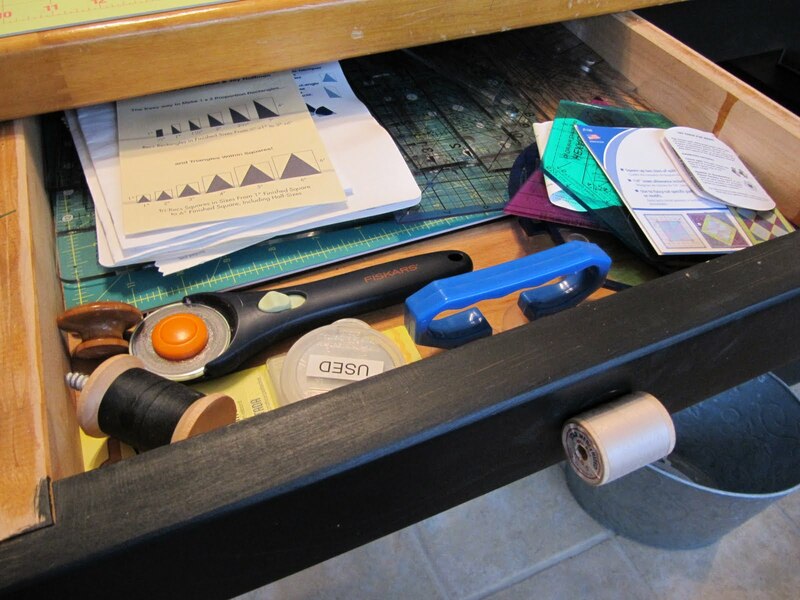 Here is a picture of the only drawer on my cutting table. It holds all my quilting rulers. I'm showing you this for the handle idea. 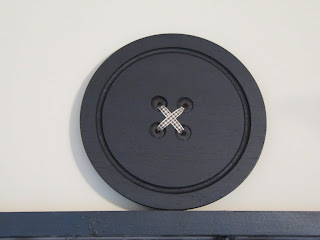 I changed out the knob for a spool of thread...click here for that idea. On top of the table...I lined up metal boxes and labeled them to hold all the scraps that I cut down to size as I am cutting out a quilt. 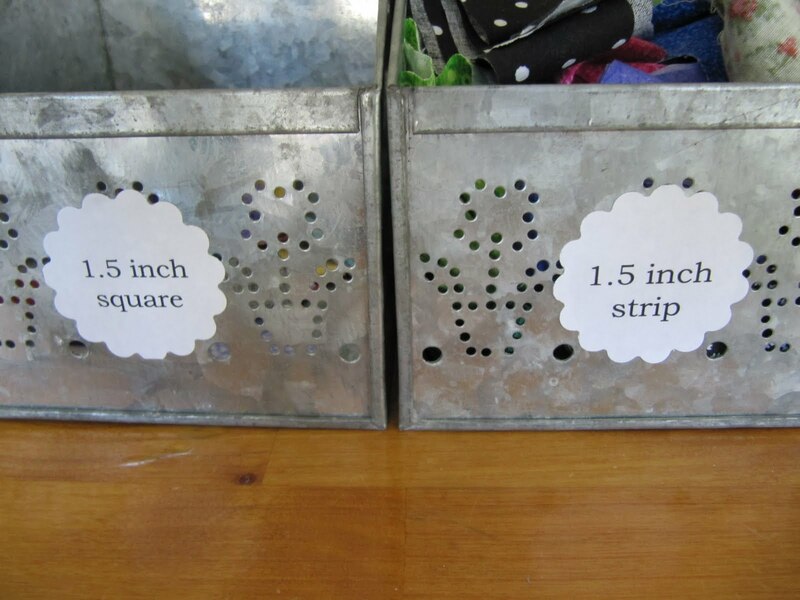 Each box holds squares or strips from 1 1/2 inches all the way to 4 1/2 inches. Keeps your scraps organized and you don't have to cut them down later if you do it as you are sewing. 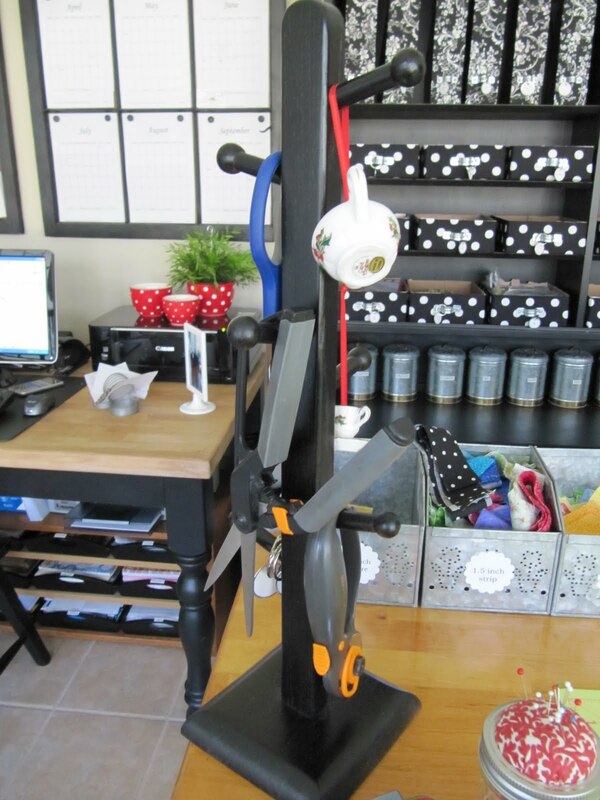 This is an old mug tree (holder) that I now use for my scissors and rotary cutters. Keeps them off the table and not buried under fabric. Big metal galvanized tubs from the hardware store hold batting and fabric that isn't 100% cotton. When we have family functions, I also use these to hold soda, water and beer bottles. and lastly...I mounted curtain rods on all three sides of my table. 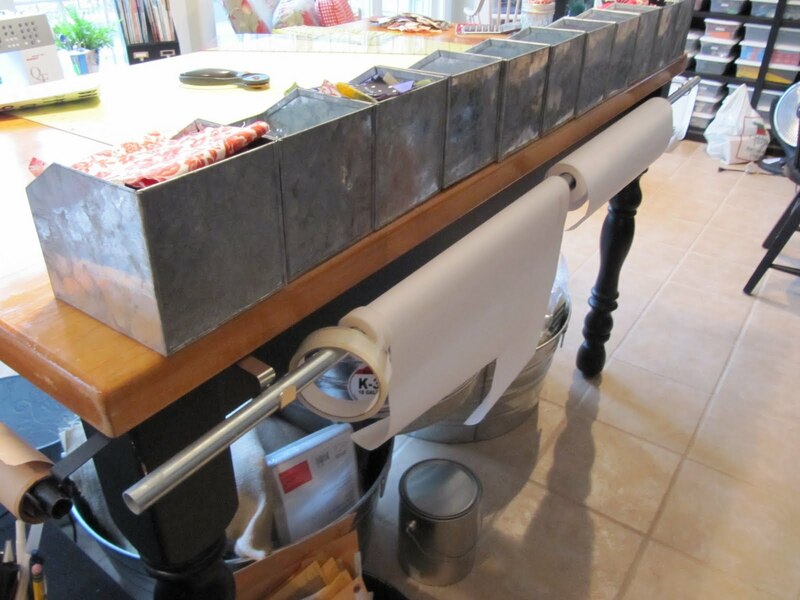 They hold freezer paper, Heat and Bond and other rolls of paper. Easy to cut off, always easy to find and not wrinkled. Hope you enjoyed the tour. 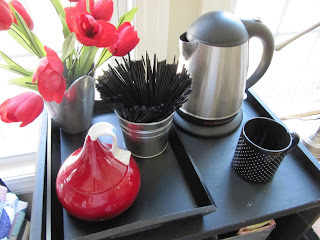 I just love sharing tips and tricks and especially, inexpensive ways to make your space work for you. 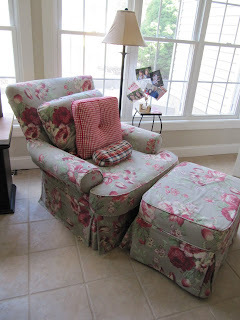 *UPDATE…click HERE for the link to the post with new ideas and project in my sewing room. Pop over for a look!! This room in a word: Amazing. So many clever tricks and ideas, my head spins! Karen can you come help put my little room in order?!? I can't seem to get it together. I so love and envy this room! wow i'm impressed. these are great ideas. i'm about to move my sewing room from what will be my new baby girl's nursery, so i'm looking for good ideas. 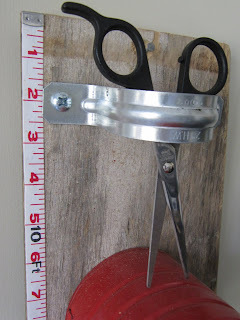 LOVE what you did with your grandfather's ruler and oil can. so sweet. 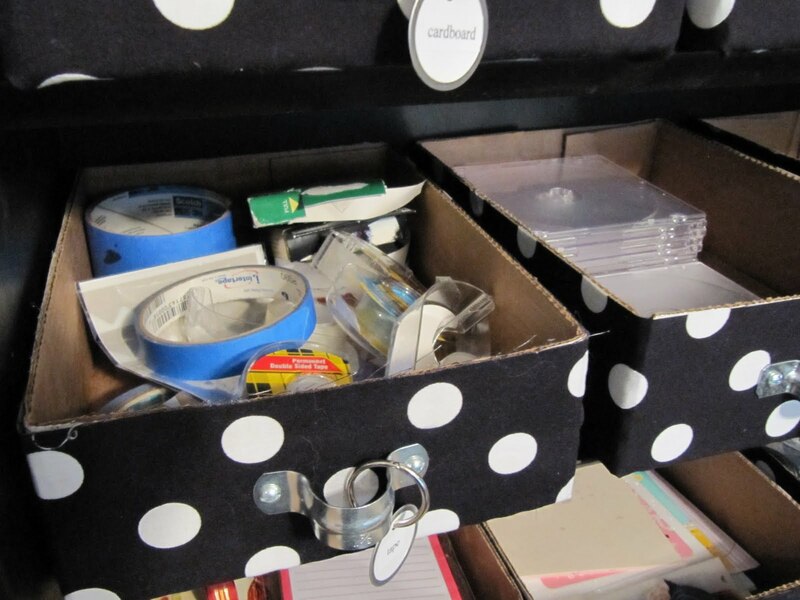 Wow, what an abundance of clever ideas for organizing your space. Thanks for sharing. I love sharing a cup of tea and someone else's hard work! Very enjoyable and inspirational! 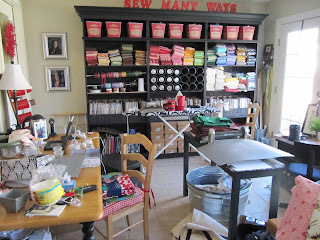 My sewing room is just about ready for another major clean up too! You have the best ideas and craft room! Love the blog. 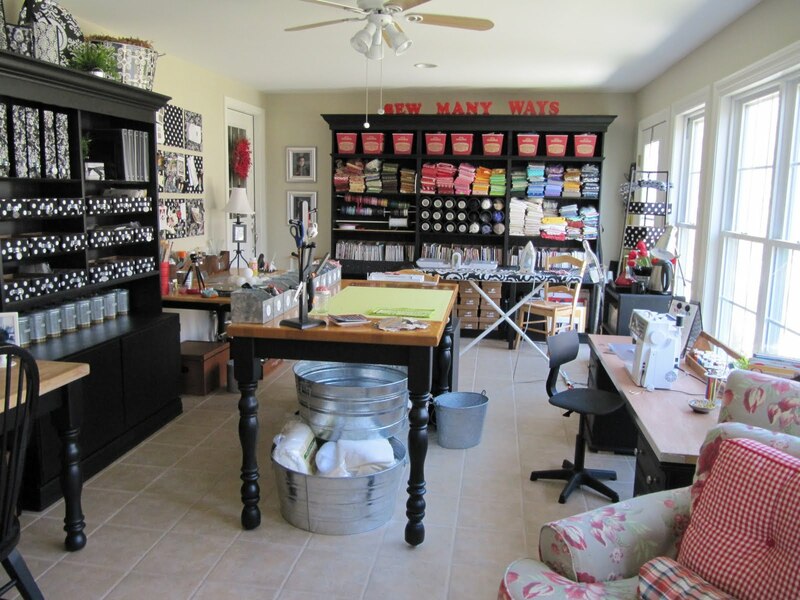 your sewing room is wonderful! I recently moved, so I am still organizing mine, but I do have ideas for it! 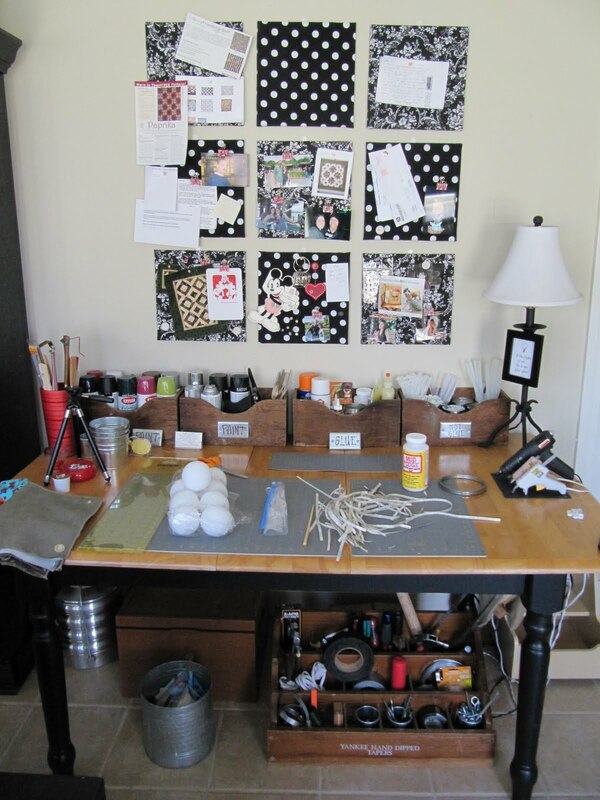 Your sewing/craft room is the room of my dream. I envy you. I don't have a sewing room yet and I won't have it till one of my two children fly away from the nest. So I sew in the living room and tidy up after every day. 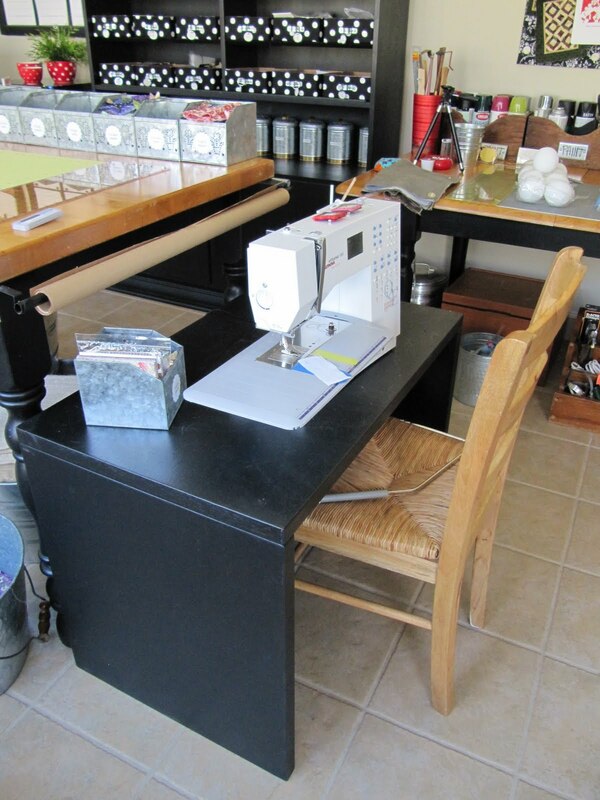 How I would like to sew in your sewing room, you have great ideas. If I had your room I would never tfo out of it. Looks great. I'm in the process of cleaning mine AGAIN, lol. Lots of great ideas and good use of space. I was thinking of turning my table, since I cannot get to it on the wall, would be better out more. You have the best craft room. So glad it isn't in the basement with the threat of water leakage again :-) Love, love, love your pretty chair with the ottoman. What a comfy spot. Where did you find that gorgeous slip cover? Realmente su manera de ordenar no tiene precio!!! Me encantan TODAS las ideas que ha usado y sobre todo me encanta el resultado. Ojala yo fuera capaz de ser tan organizada, sería como un sueño hecho realidad. Muchisimas gracias por compartir sus ideas!! Wish I had half of the space you have. But you use it so brilliantly! I am coming over. I just want to sit in your room. I want to soak in the creative vibes in there. It's GORGEOUS! WOW!! this is wonderful! Thank you for so many tricks and tips! I am going to be creating a room for myself and now I have so many things to start looking for! Love it!! All of it!! May I ask where you found the metal baskets that hold your scraps? 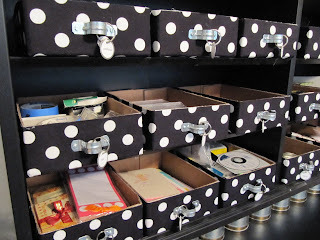 "Sew" many wonderful ideas for organizing and keeping it cute and co-ordinated. What a wonderful space you have. Wow.... that's all I can say. 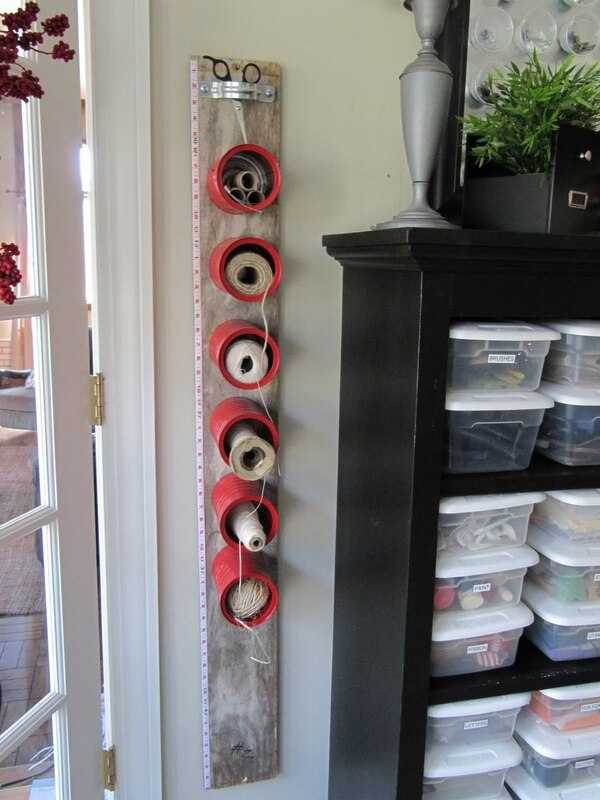 Your craft room is amazing!! I'm so jealous!! One day.. One day!! Wow, I am tired just watching that....you are so amazing! Wonderful ideas abound! So many I had better get started!!! Oh my...I want a room like you! I have a craft room but it needs more organization. Thanks for the great ideas, you gave me a visual of what my room can become! Such an incredible room! I have never seen a sewing room as great as this. So organized and well laid out. Fabulous job! I love knowing that my sewing room is not the only one that looks like Harry Carry happened in there! Thanks for sharing all the great ideas and encouraging photos! I love your room! I don't have near that amount of space, but I'd love to take the time to empty my room and start over and incorporate a few of your ideas. Thanks so much for sharing - it truly looks like a designer room. Karen, you are amazing. What a fabulous room to make a mess in. 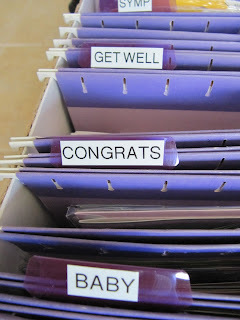 I love all the organizing ideas. Wow! You are the queen of organization. I am so jealous of your room! It is truly wonderful!! I am sure you hear this a lot...I love your room!! I love everything about it. As I went through this post I just said "OH" over and over again. Thank you for sharing your wonderful ideas. 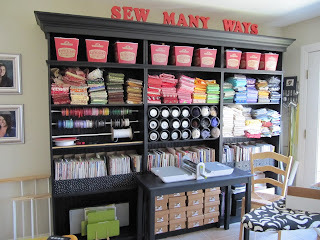 When I get my own sewing room this will be my insperation!! Yours is my favourite room. And there is so much light. I even liked your room when it was messy. 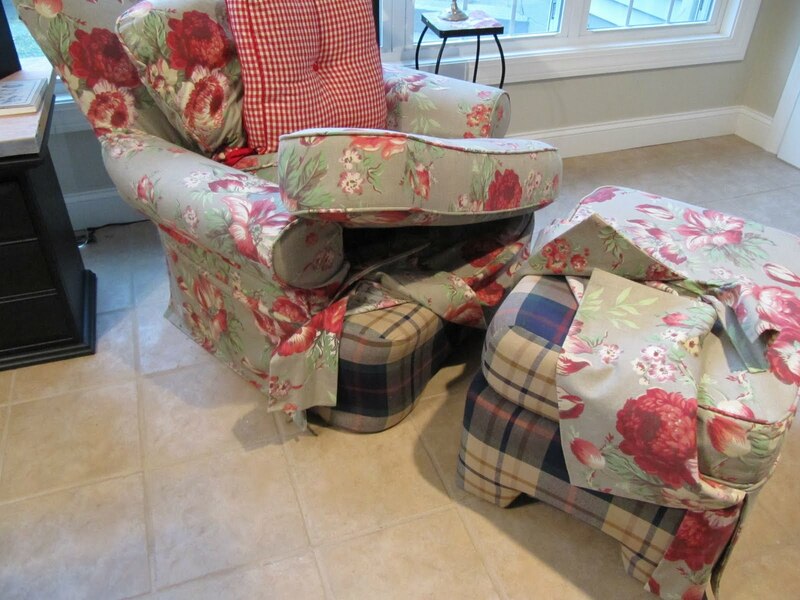 I'm not sure what I'll do first, but the slip covers for the chair looked a possibility. Did you make them or get someone else to? I can only make quilts, not even a handkerchief. WOW, can you come and sort out my sewing room(hovel)? What a lovely space with so many nifty ideas. There's so many fabulous ideas there, Love it! What an inspiring post! 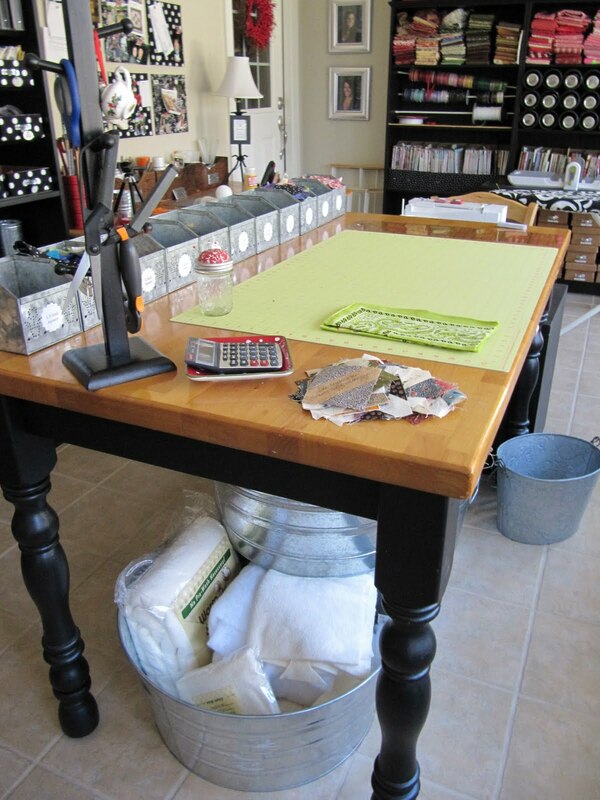 Thanks for the cup of tea :) Funny, I seam to work better when my sewing room is a little messy or disorganized too! Thank you for the overall download of your room. Love your ideas and looking to use some of them soon. 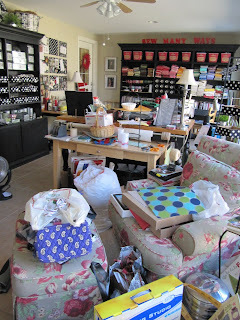 Oh, how I wish my sewing room was big enough for all my stuff plus a big comfy chair like you have. Your sewing room is just wonderful! You see a purpose in things that I wouldn't think twice about. You are so clever - I'll bet all your friends call you Martha! Thanks for sharing your space with us. 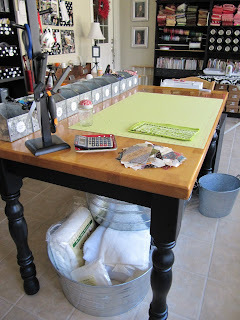 I need to get off the computer and take a fresh look at my sewing room! 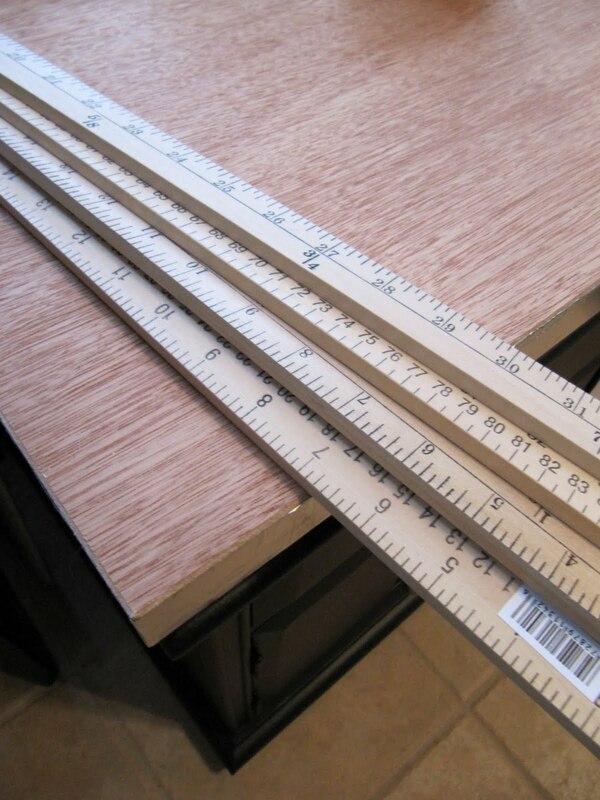 And yes, put the yard sticks around the table! I love that idea! Beautiful, beautiful craft room Karen! Thanks for sharing all your good ideas! 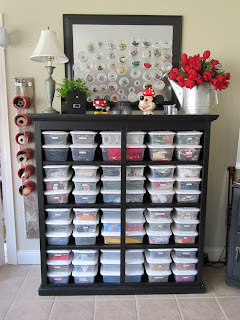 This is just fabulous and I have saved this in my "favorites" for reference as I finish putting together my own little home office/sewing room. One question though - Where is the cabinet from that holds the plastic Sterilite shoe boxes? I need that! 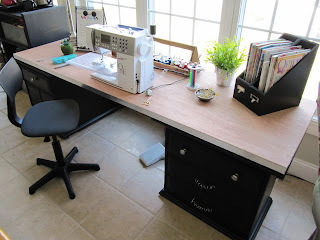 I had read all of the posts on your sewing room, but it is so much fun to see it all at once, it really looks great. 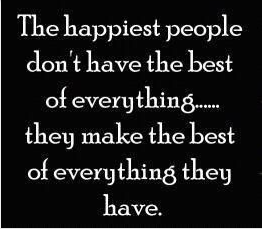 I am even more impress as I try to set mine in my new house, too much stuff, not enough space. Thanks for sharing all your ideas! I love it more every time I see it! Wow! Unbelievably clever ways to make a space organized. 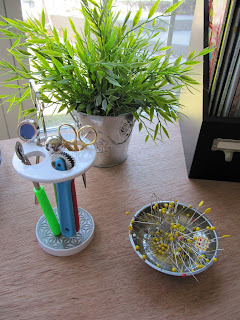 I especially liked the tips for making a sewing table, eyeglass holder(I am always losing mine), and elevating your cutting table. I am going to keep reading some of your tip posts. Thanks so much for sharing. Too much fun! Wow! 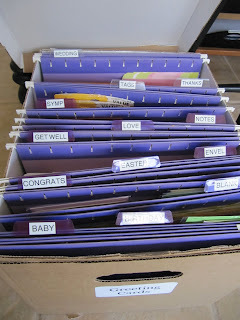 I thought I was pretty organized, but you've got me beat!! You are a very clever gal!! I've always used your room as an inspiration point for the home improvement ideas we try to work into. I've shown your older makeover post so many times to friends that they say, "Did you learn that from Karen?" Really, it is a dream room for so many of us, I'm just telling you again. Thanks for the informative, inspiring share! What great ideas. There is something for everyone. Thanks for taking the time to share. I love how you have repurposed so many ordinary things and made the beautiful. Thanks for the inspiration! Wish we could buy those table risers here in Australia, it is something I have been wanting to do but can't find here. Loved the update. I saw a few new ideas I must have missed before. I always love your ideas! Everytime I read about your room, I always find something else that inspires me. Thanks for all the tips, and keep them coming along. I just love the room and how you've organized it. Wanna come to my house and help organize my room. You truly are an inspiration! I am embarking on a re-jig of my craft space, it's very small and I share with my son and hubby... but the first place I came for a dose of inspiration was your blog! You truly are the ultimate "Ideas Girl!" I hope you are well sweetheart, although I haven't been in touch for ages I think of you often and love reading your blog! 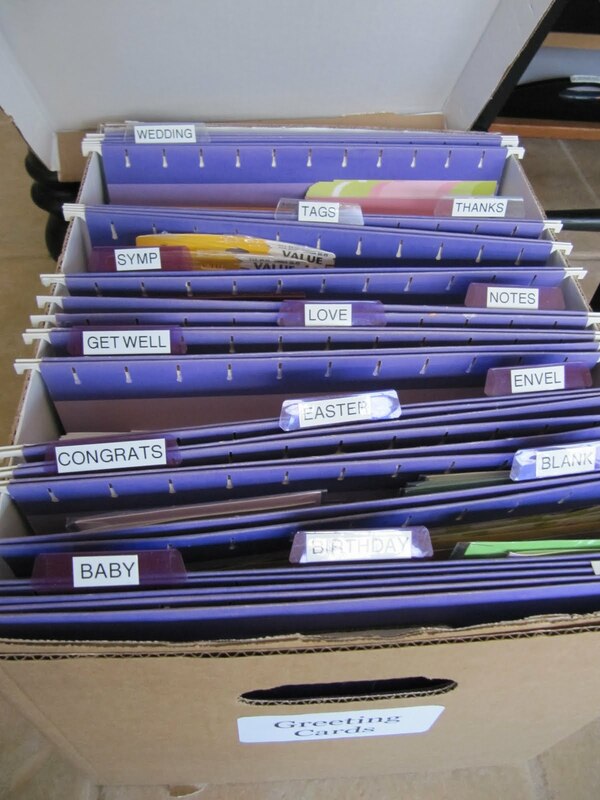 You are truly amazing....and organized ! Now, I just need a big room to organize all my stuff in one place! Right now, they are all over the house..lol. 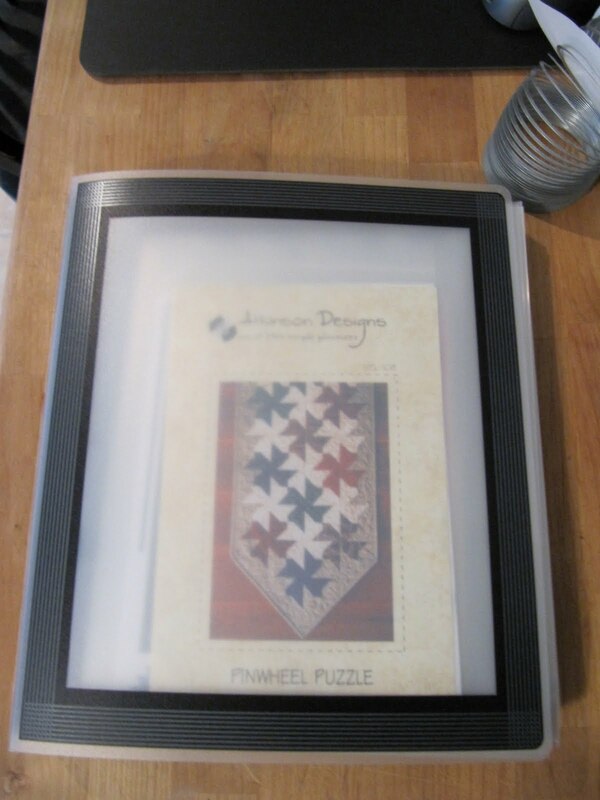 I'm just going to set up an area of my finished basement with a quilting frame - another area is a machine embroidery, cutting table and computer space. I wish I had your creative knack for such pretty organization, but this post esp. 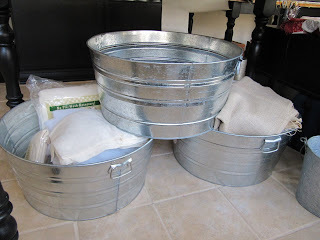 is very inspirational - I'm going to repurpose things from my overstocked kitchen - thank you for the GREAT post!! I believe it's the best post I've ever seen in blogland! Every part of this room is nothing less than brilliant! Do you want to come to Oregon to makeover my new sewing studio????? We are remodeling now and living in a 2 bedroom apartment with 2 young kids and 3 cats. I haven't done much sewing since we moved here. I can't wait to get into my new space. You have such an amazing creative space, Karen. Great storage tips, too. I love your room! I would love to have a large room like that, unfortunately, my room, tho' I love it, seems so tiny, 12X12. I have seen a lot of the tips and tricks before, but it was really fun to have a tour through your room and remember soms tips, like o yes, and never seen others before! 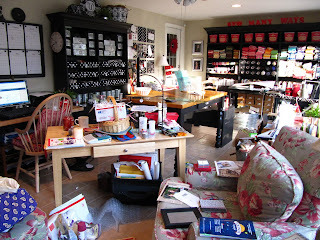 Oh my...don't let my husband see how organized your crafting space is. Mine's always a disaster. Love your ideas. This is my dream room! You should do the ultimate giveaway - your time, by helping one lucky winner (or me) convert a space into a beautiful functional studio. Thanks for sharing. I love following your blog. This is awesome!!!! I can't even believe it!!! You should go into business selling your organizational skills along with your decorating skills. Your room is absolutely beautiful! WOW! 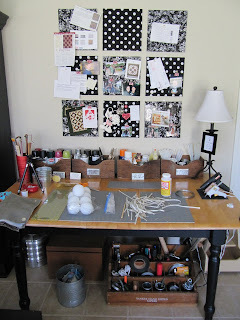 What a beautiful sewing room, and I love how you make something spectacular from throw aways. 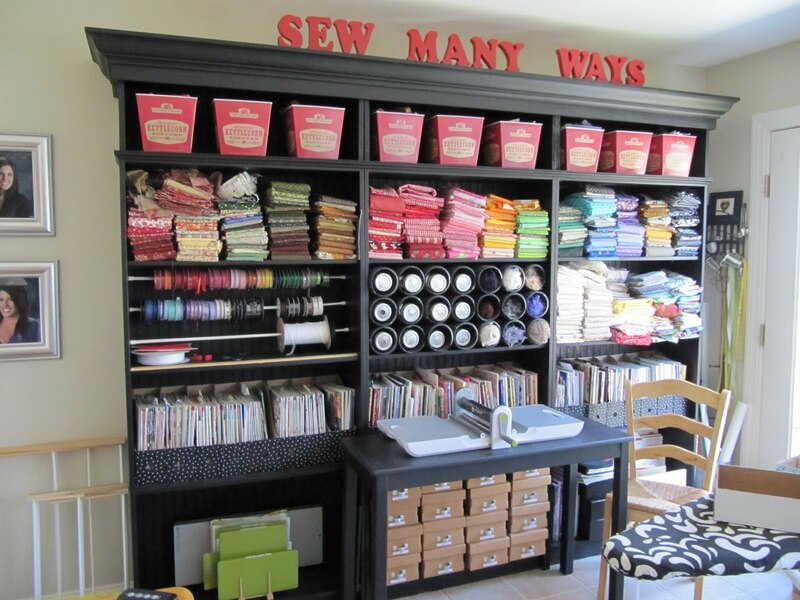 I have a serious case of sewing room envy now! Your space is so beautiful...and so well-organized. Love it! Your photos are an example of what can be accomplished with some thrifty thinking and a little elbow grease. Thanks for taking the time to share your work space! You have the best craft room EVER! I have always loved the posts about your sewing/craft room and always been inspired by it, and didn't think it could get any better or that I could love it any more than I already did...until today's post! I am seriously IN LOVE with your room! 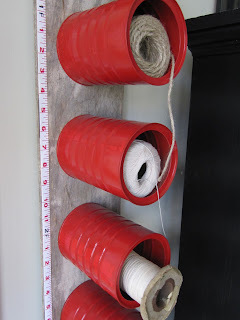 I love all of your storage ideas and love that they are all thrifty, practical, and inexpensive! (I hate paying full price for anything, too, and would rather buy cheap or remake something I already have. My husband calls it being "cheap" but I call it being "crafty-thrifty!" LOL!) I am saving this entire post as a source of inspiration. 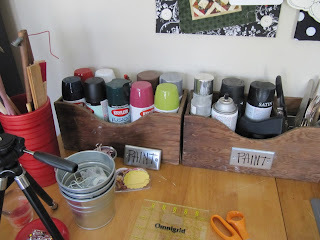 I had already decided I wanted to redo my craft space before now, but this post has definitely pushed me over the edge and given me lots of ideas! Of course, my space isn't as big as yours, but I can still use lots of your ideas! So, thank you! By the way, I have to ask, where did you get the metal bins that you put on the table for your scraps? Knowing you, they probably came from the hardware store! But, I NEED to know where you got them!?! Thanks again for all your crafty ideas! LOVE THEM ALL! I totally LOVE reading your blog!! 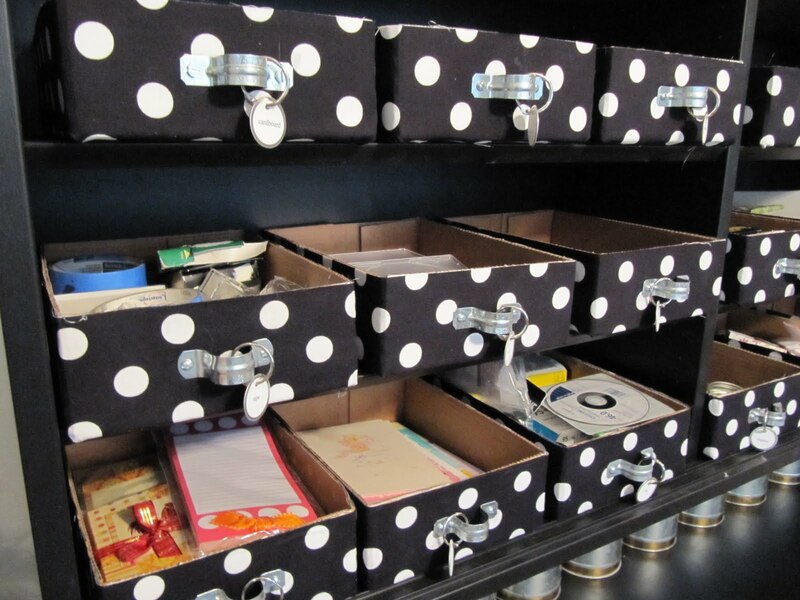 Love all the storage ideas...now how to use them to declutter my own craft/office!!! Just when I thought it couldn't get any better... your room continues to amaze me!! It is AWESOME! WOW! What a creative and lucky lady you are! Such a cool room with so many lovely ideas! Thanks for sharing. So many good ideas and thank you for sharing. Wow... just wow! When can I move in? I love, love, love, love this room - everything in it!!! Thank you for sharing your room! So many wonderful ideas. Very inspirational! I definitely will incorporate your ideas into my room...when I get one! What a lovely sewing room! So many clever solutions! I'm taking notes for my own studio. That room is amazing. 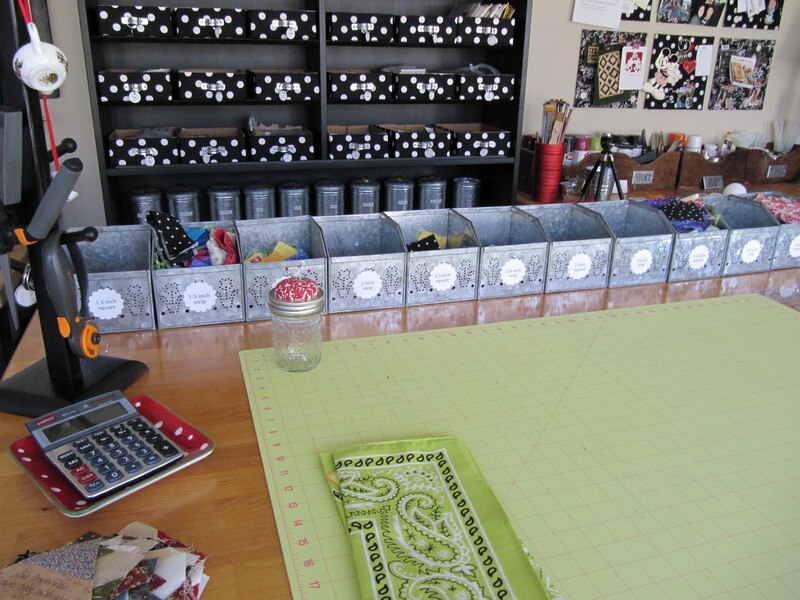 I dont think ive ever seen such an organized sewing room before. Im so jelous, you have all that space just for your sewing gear. My sewing room is the space underneath our stairwell! Oh my gosh!!!! This room is absolutely gorgeous!! so jealous, I have a wonderful room but it doesn't have all the 'fixins' that you have...my gosh it will take me days to just take it all in! You are awesome!! Karen, I could sure use your help. My sewing room has gone from a small bedroom, that was reclaimed as a bedroom when a grown son moved back in, to the shed in the backyard, back to the small bedroom, then having to give it up to use as a small nursery when the grandchildren come over every other week. I took over a small corner of the "nursery" when the other grown son moved back in and now I'm in a small corner of my bedroom. I think I'd be better off in a small pickup with camper shell. You are my inspiration. 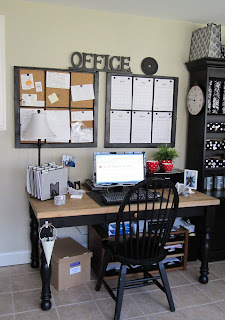 Started organizing an office/crafting room last fall. Separating stuff was a good start for me. Love how you use recycled materials and mount on the walls and furniture! Karen, you are amazing!! So creative and talented. 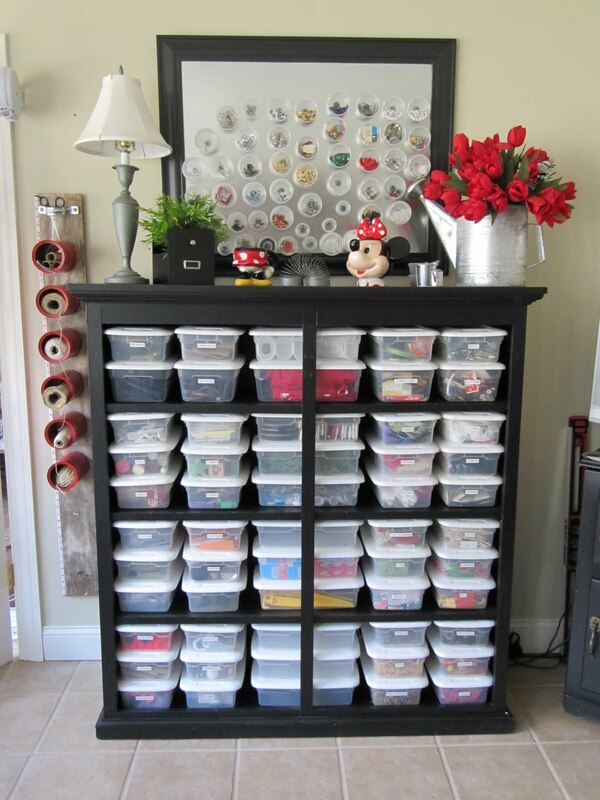 Keep posting your clever ideas...love, love, love your sewing room!! Can't wait to see what you create in it next! That`s quite a sewing room, Karen! I am just getting ready to redecorate mine, but it is much smaller, maybe 8.5x11ft. I did, however see a couple of useful tricks here that I plan to incorporate into my "dream" sewing room. Thanks for posting this for all of us! 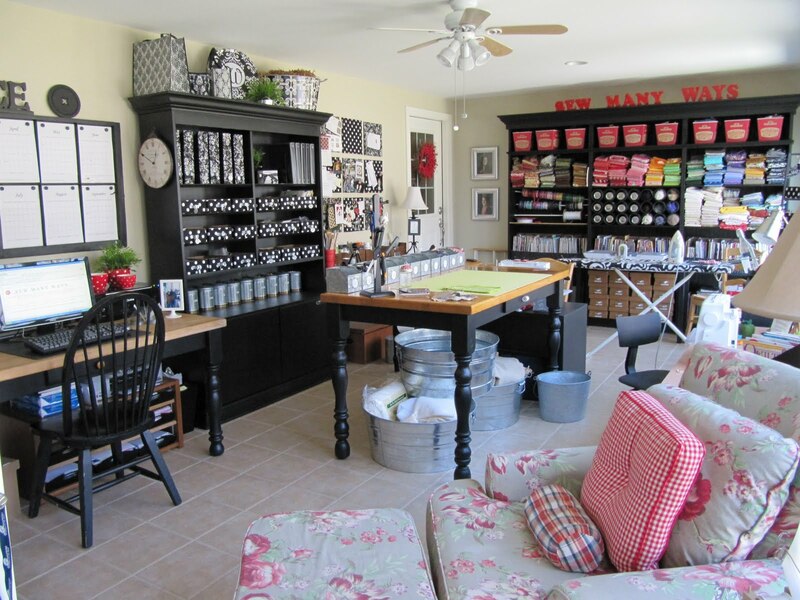 Karen, I love, love, love your sewing room. You have so many creative ideas. 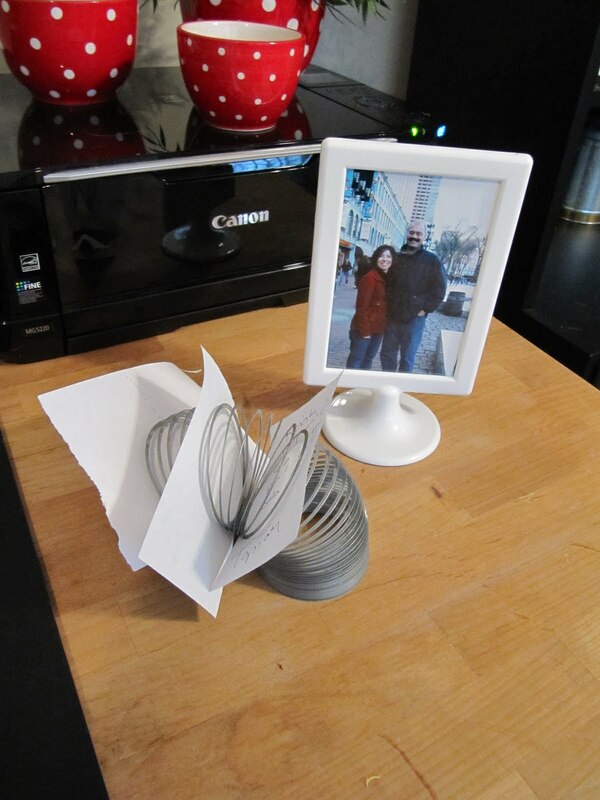 I knew all those coffee cans that Mom save year after year would come in handy some day! I'm impressed with your organization, also. Love your sewing room ideas. Can't wait to use some of them. They are all great. Thanks for sharing. I am jealous!! Mine is never so neat and organized! Great room Karen. First time viewing your blog, but I will be back. Wish I had more room to do more of your tips, but 10x10 is biggest I get. Better than nothing, right? Keep up the good work with all your inspirational ideas. Wow, what a fabulous studio/craft room...and such great use of space and wonderful ideas that I am going to use...Thank you !! What a fantastic space you have. I have been trying to get our spare room as a work room, but my husband says I have to sell some more bags first. Thank you for the wonderful tour and all the fantastic ideas that you've shared! What a fabulous space - much better than the basement! Hold on while I pick up my jaw off the table. Thanks for sharing. 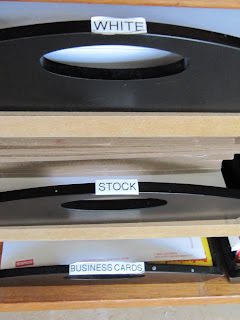 got lots of organizing ideas--cereal boxes for magazine holders! Who would have thought! I am in the process of re-redoing my room. Yours is amazing and I will be using some of your great ideas. It's so fun when you figure out the exact thing to use! Thanks for sharing your tips. Wow, my daughter in law sent me the link to your room! Great ideas. 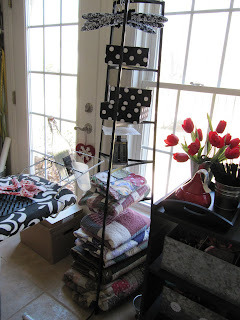 I am working on my sewing studio, but you've given me some awesome new ideas! 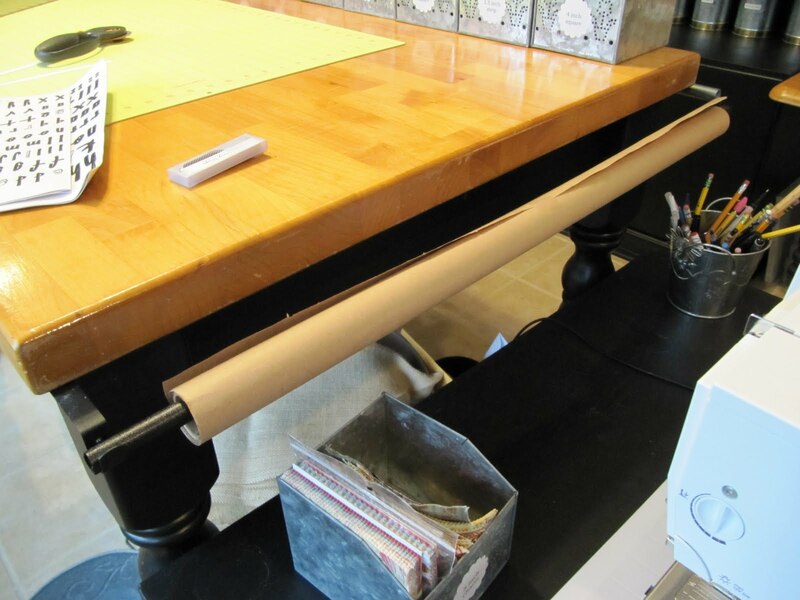 Love the tension rod in the book shelf for ribbons and the curtain rods on the sides of the table for rolls of paper, etc. I'm off to the hardware store lol. Karen, I loved your sewing room. You're so creative. I loved your ideas! I'm very motivated to have a place for my arts, crafts and maybe one day sewing now. (*v*)Thank you for sharing!!! I love your post. 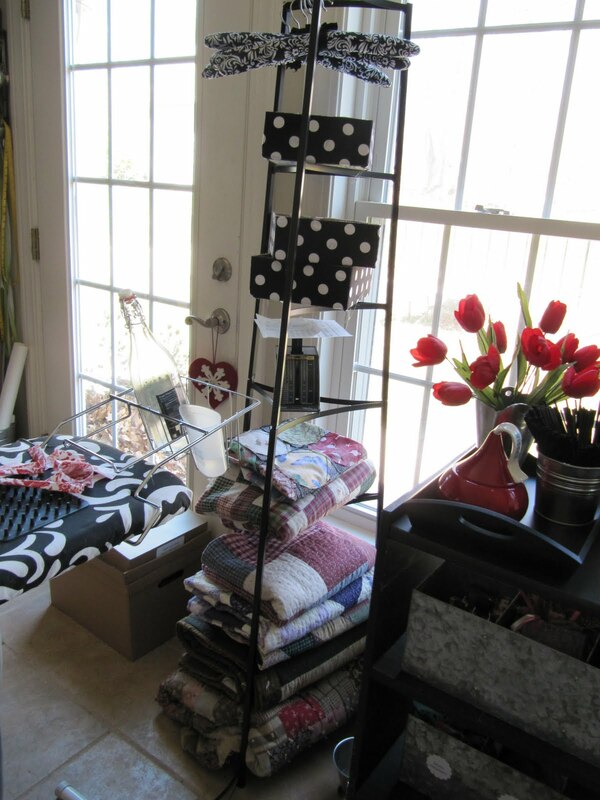 I am just in the process of organizing my own sewing room. This is the perfect post for me. I didn't catch where you were found your metal boxes for the fabric strips. I love the way you use anything and everything for storage. I have a sewing/craft room. I have a shoe storage on the back of my door with various supplies in it, bias, needles, trims, etc. The magnetic pin holder is great. Just don't keep it too close to your computerized machine. The magnet can skrew it up. Don't know how but I think it erases things. OH MY HEAVENS! I think I just died and gone to heaven looking at your craft room! I would just LOVE to have a space like that. So beautiful and functional. This is a wonderful space! Thanks for sharing. I really enjoyed all the tips and ideas! We are moving and I will finally have a little craft space. I am so inspired by your post. At first I thought their is no way I could ever have a room like that. It appears to have costs a great deal to decorate, but your break down had me constantly saying "No way...I can't believe it". Thank you so much for all the great ideas. This post makes my heart sing! I am obsessed with containers and organization. I would DIE for that craft room. JOB WELL DONE!!! Wow! Your craft room is amazing! (Jealous!) 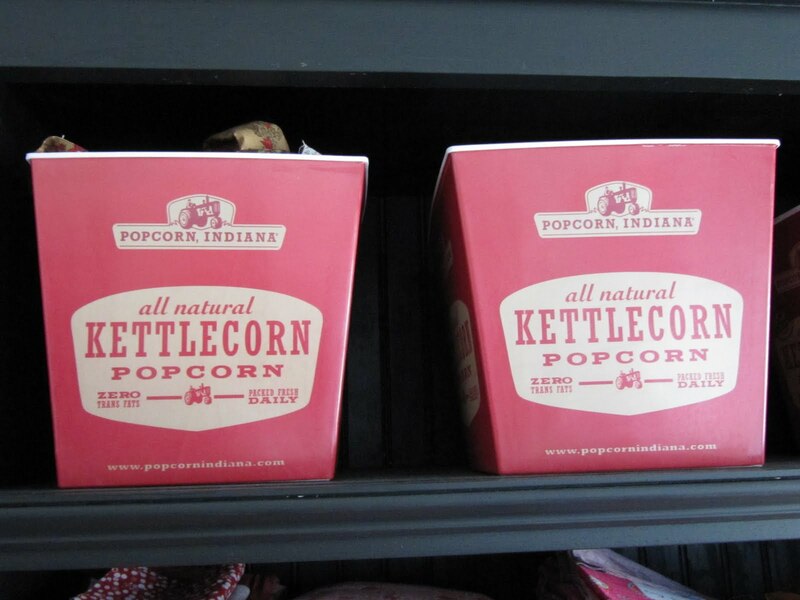 I especially love the black and white cardboard boxes with the super cool handles. I really think the handles totally transforms them. Great job! Incredible! Beautiful, functional, with loads of whimsical ideas. Kudos!! Thank you so much for sharing your sewing room. For taking the time to post all those great ideas and links. I am so ready for a room to sew in..I just have a corner of my bedroom now. I can never find anything! My girls are in college now and still come home for holidays..the day is coming when they won't and I will get a room to sew in but then I won't have them at home. 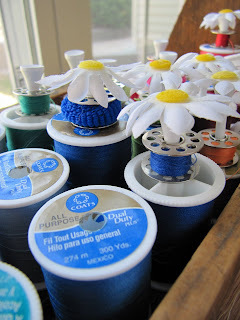 I love that you have a space for them if they want to sew with you. Love your blog. Wow to have such a space! 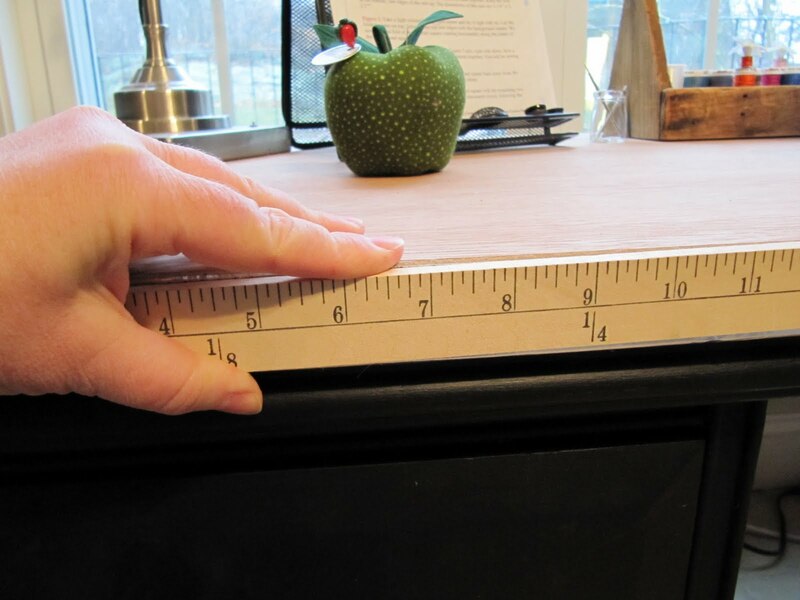 I learned many tips and tricks for when I set up my small crafting areas in a few spots in my tiny house. No large room but several areas I can take as my own, if I keep it all tidy. Thanks for the ideas, I believe reusing thrift shop items & painting them too. WOW! I want a room like this! Sigh.. must finish college so I can afford a house big enough for a spare room to do this!! This is incredible. You have helped me so much with your ideas. Thanks so much! Wow! That was the best tour ever and I loved all of your ideas. I am in exactly the same place as you that the daughter is off to college and I am currently unemployed so I spend my days doing what I love most - Sewing!! WOWEE!!! The mind is definitely spinning! What a put together room. You would never know that those furniture pieces weren't hand picked from the store to fit in that room!! I love all the creative ideas on the storage. This room just makes me want to craft looking at it. Can't wait to have a designated craft room!! *WoW* .. That's the only word I can think of right now .. What a great and beautiful room you have! I'll come back in a couple of days to read all the tutorials .. Can't wait to get started in my own home! i'm completely blown away. amazing. beyond well done. Okay, so I need to start from the beginning of this super exciting post to write down all the things I need to look for in my garage or purchase! You certainly inspire me! I kept reading and shaking my head wondering why I didn't see how that certain object could be used! I looked at the same things! OH MY - I so want to come over and play in your room!! I'll just sit in the lovely chair - with a cup of coffee and marvel in this awesomeness! Your room is so amazing, I love it! I would love a place to keep all my things, right now they are in a corner of our basement and hauled up to the dinning room table when I need them. With two little girls, it'll be a long time before I can have a craft room, but when I do someday I would love something anywhere close to yours. Thanks for the inspiration! What a fabulous sewing room. Lots of great ideas!! The most inspiring room that looks REAL & FUN. Just perfect! What an awesome space, thanks for sharing so many tips. 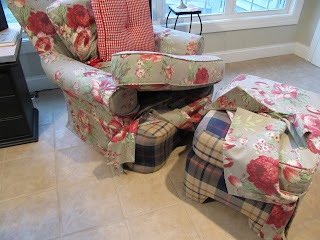 I think I need you hear to get me started on the redoing of what furniture I have! You have done such a wonderful job of you space! Thanks for sharing! Your sewing room is truly amazing. I hope to be able to have a dedicated sewing room one day- for now I sew in the dining room. You are so clever! As i was reading about your sewing room, i turn around and looked at my sewing space...hahahaha but i love my space...you have some awesome ideas and i will use a lot of them thank you so much for sparking the thoughts for us to turn around and get moving..
Wow, this is amazing and so inspiring! It looks like something out of a Ballard catalog but it's so nifty that you created it all yourself! 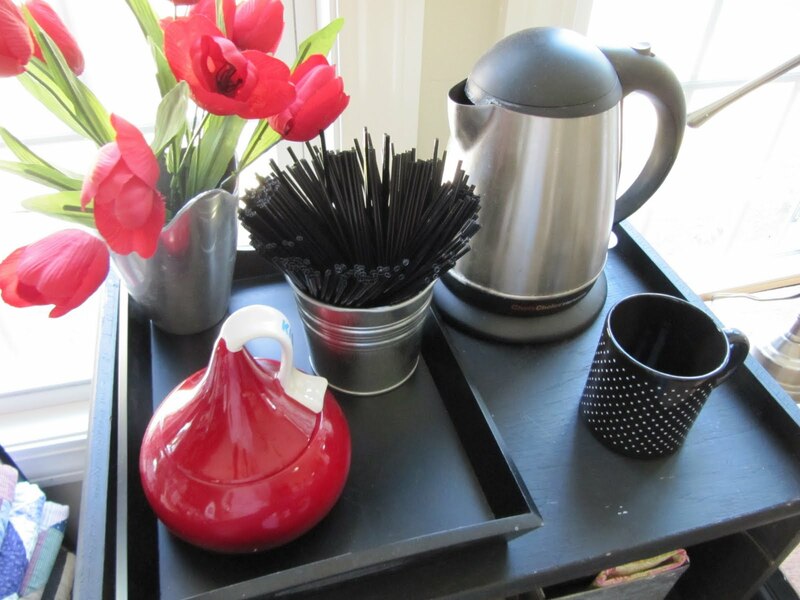 I love the added finials to the table (I have the same table but in white) Soooo many great ideas. I'm totally bookmarking this for a someday project. Thanks for sharing and linking all those tutorials! I LOVE your blog! I found you over at Designer Gardem. Oh my goodness do you have some fabulous ideas. I am so excited to follow you. Boy do I have room envy! I am fortunate to have a room of my own as well, but I think 3 of my room would fit in your room. All your amazing ideas however have inspired me to make better use of the space I have. I am trying some of these for sure. Not to mention the hours I will be spending scouring your entire blog. This is amazing!!! I love the propel box and cereal box ideas. 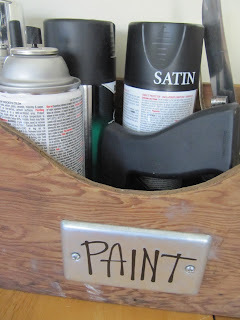 I think I'm going to start painting my cheap fabric shelves too! Thank you so much for the ideas! Can I hire you to come create a space for me?!? Seriously though, this is amazing! I have some serious envy, and will be stealing ideas when we move in to our house! Thanks for posting ALL the small details, since it's those that truly make the room functional!! 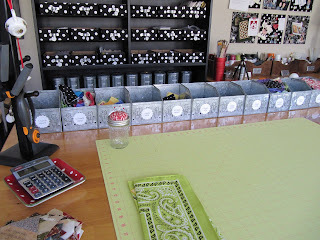 I am so envious of your quilting/craft room! Mine has been overwhelmed with stuff being tossed in there just to have somewhere to put it "temporarily". I would love for you to come help me organize my room! I think I'm just overwhelmed! A couple of family illnesses, a new marriage and moving my husbands things in, I just got distracted and too busy to quilt. Now I think I'm almost ready to begin again, but I really need some serious organization. I have a knee wall that I want to cut into and put cabinet doors so I can access all of that storage, any thoughts or ideas on that? I'm serious, do you consult with others on organizing their spaces? 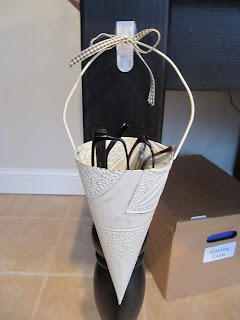 I love the way you use what you have on hand and recycle items in your designs too! Wow - your room is just fantastic. thanks for all of the great ideas. Tienes un lugar de trebajo maravilloso. Me gusta mucho y me has dado muchas ideas para aprovechar mejor el mio.Gracias,un beso. This room takes my breath away. I have been back and forth to this page probably 20 times in the last two weeks. You deserve a huge pat on the back for the wonderful job you have done in here. Functional but so stylish. Thanks for generously sharing your ideas. I'm not really sure how I've been blogging for 6 months now, and this is the first time I've seen your AMAZING blog! I haven't spent this much time on one single blog for a very long time. Very fresh and unique ideas. 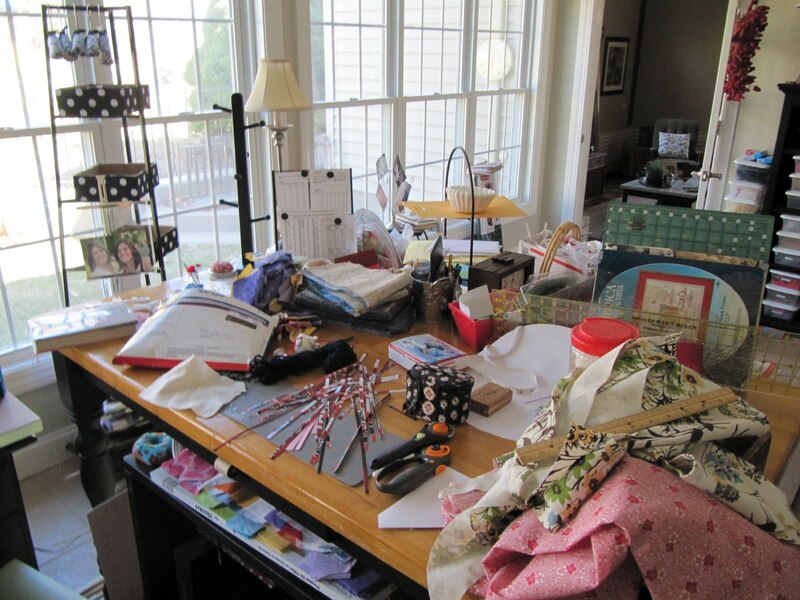 This craft room is just the epitome of craft/sewing rooms. I bow to you, oh craft queen. I have become a loyal follower and will eagerly await your next brilliant post! I hope you never have to deal with a flood again! At least your craft room is safe. Thank you for all the organizing and TTT posts. 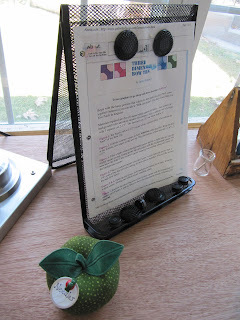 How awesome was this little tour of your VERY CREATIVE, RECYCLED room! Thanks for all the terrific ideas and your room is FABULOUS!! 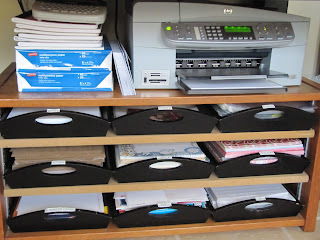 Hi Karen, I have found your blog through Crafty Storage and I must say that it is a great craft room. Thanks for all the tips you have given, there are so many ideas here. Hi Karen, I love your sewing room. It's simply awesome. I love your blog too. 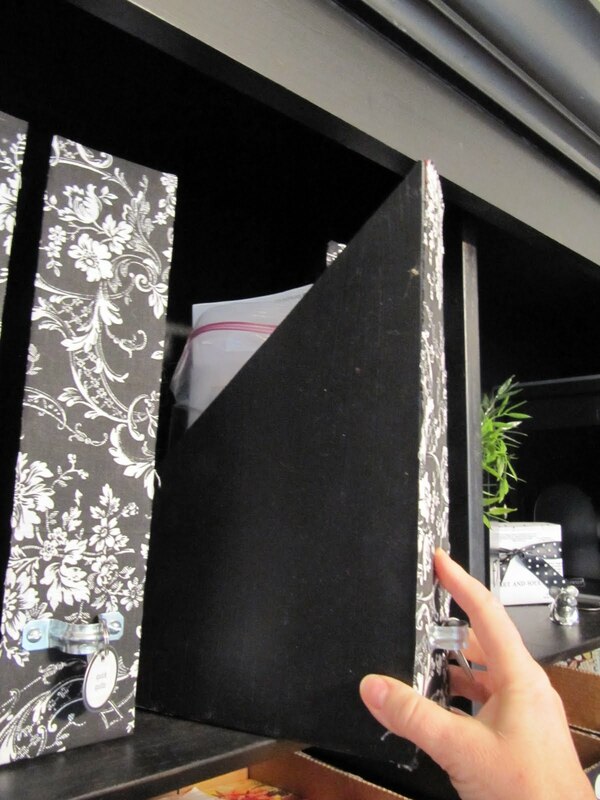 I also love to move furniture around and make my own storage items out of found stuff. Thank's for sharing such a wonderful inventive space. 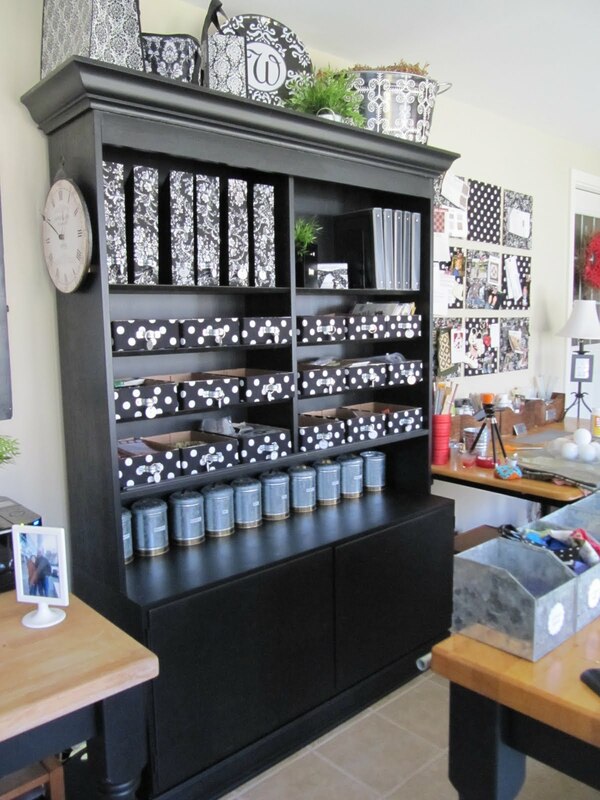 Visiting from Crafty Storage.....wounderful space, fabulous ideas. 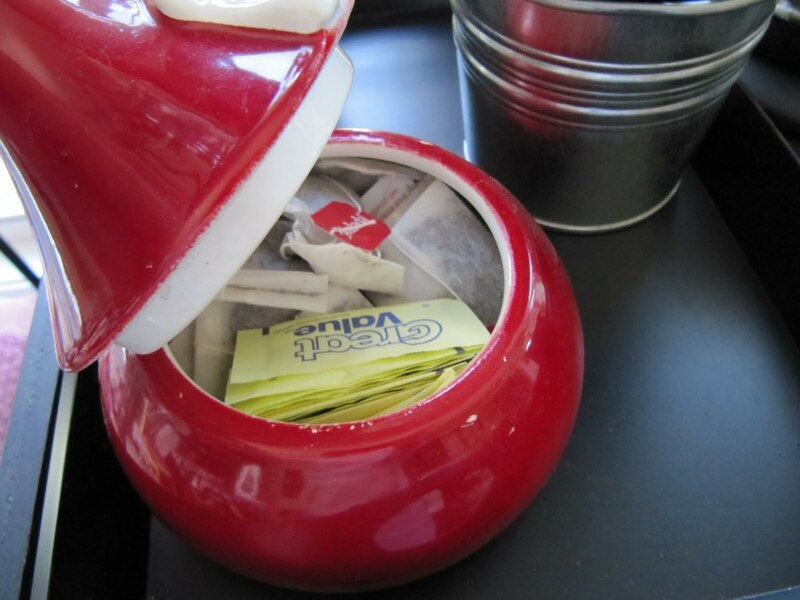 Love your thrift shop finds and repurposing! Wow! What a fantastic space! Lots of thrifty ideas. It looks like such a fun space to create it. I would never want to leave. 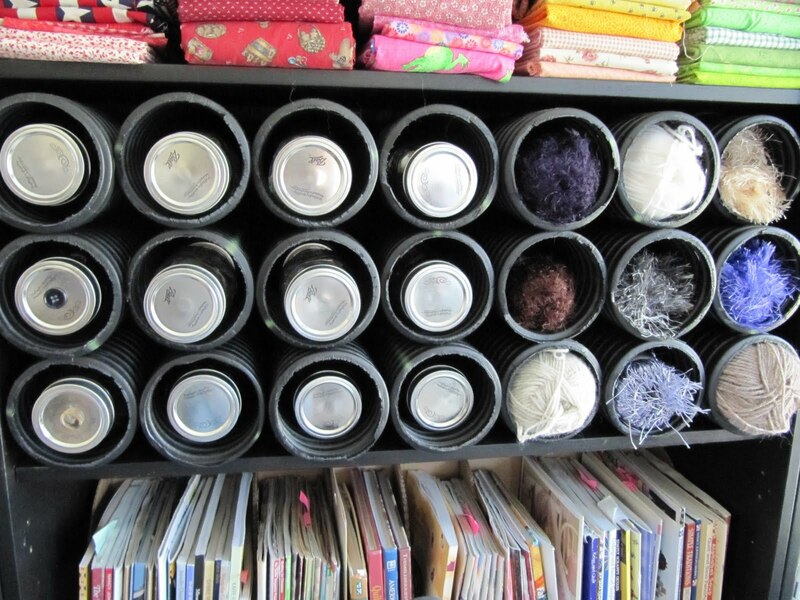 I really like how you've repurposed the coffee cans. My head is just spinning with all of these amazing ideas of yours!!! Thank you for sharing your creative space!!!! Beautiful room!! Love everything you did. Thanks for posting! 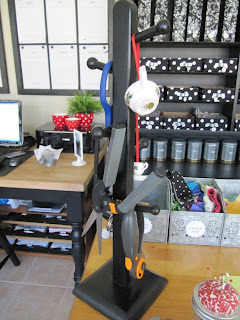 you are so creative for having repurposing items fit into your fantastic sewing room. Thanks for sharing!! Um, Yes, Can I move into that room. That has to be my dream craft room. I've been looking for some cheaper ideas of how to organize my den/craft room. Thanks!! Just discoved your blog, you are one amazing lady. I can't wait to enjoy every one of your post. Question please, how did you attach the finials to the bottom of your legs? Did you just use glue or glue and a screw. I have that problem, such a simple solution, beats having to get a new table. Can I just say..LOVE YOUR ROOM! 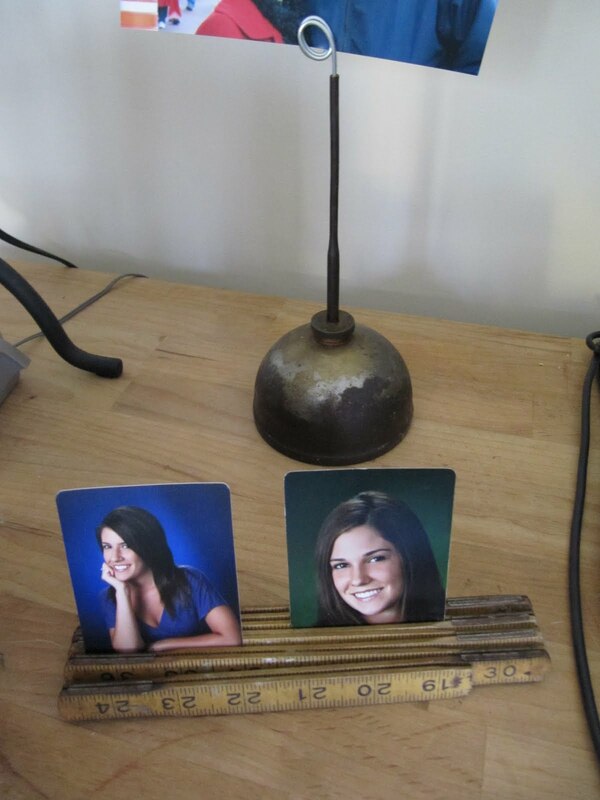 I thank you for so many great,clever, inexpensive ideas to use! Now that is an awesome sewing studio! You are giving me great ideas! Your ideas are truly inspirational. I have a small room that's not totally dedicated to my crafting. I was searching for ideas to reorganize and yours are terrific.. Thanks for sharing. You are my HERO! When I first saw your room I said "Yeah who really works in a dream room." You do and I am so impressed. We will try a few of your tips, Ma'am! Karen, you are a GENIUS! I will be sure to link back to you for any idea that I borrow. Thank you soooooo much for sharing these TERRIFIC and BEAUTIFUL ideas!! You're AMAZING! So clever and creative! I love your room! I could use your help in organizing my craft room. I love your room!! 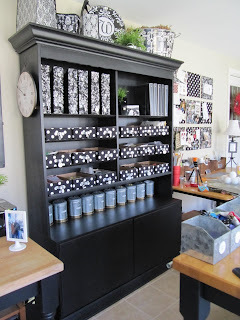 I especially love what you did with the three bookcases! I have several of those bookcases in my home, and the cheap back always falls off. I think I am going to invest in some beadboard just because it will make the whole thing so much more sturdy. Especially for the one in my daughter's room, which is loaded with books! I love your ability to find unique storage solutions to suit the way you work! Fantastic room... it must be such a pleasure to work in it. Thanks so much for sharing your tips and ideas. this room is to die for. i will be visiting here ALOT! I am speechless. You are the QUEEN of organization!! Oh how much I can learn just from this one post. 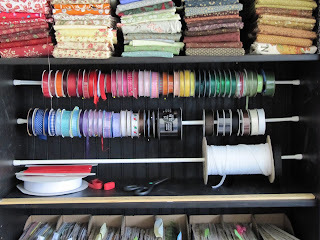 i would KILL for a sewing room - any room for that matter - that had this kind of creative energy of organization. I have just stumbled onto your blog today - but will now be an avid Google Reader! Karen...WOW. 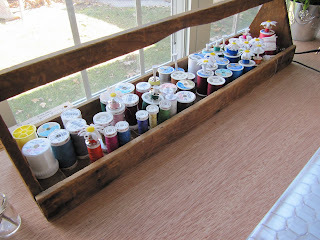 I have been looking for ideas from turning my sewing table into a sewing ROOM. After looking at MANY ideas, yours is THE ONE! 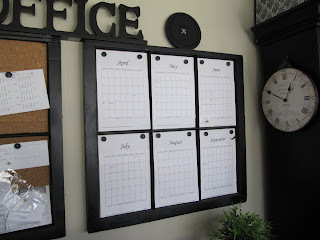 What wonderful ideas, and I love that you are budget minded like me! I am ordering the shelves, and my wonderful hubby will be doing the molding to make them look as spectacular as yours, what a great idea! I found you on Pinterest.com and wanted to share and idea that I found from another blogger that I see you don't use. Mini bolts made from comic book backers! http://smashedpeasandcarrots.blogspot.com/2010/11/mini-fabric-bolts-and-some-studio.html I will be using these on my shelves too! Great and inexpensive. Thanks for the ideas, I hope my quilting/sewing room turns out half as nice as yours! Just moved to Arizona from California and going a bit stir crazy. Missing my daughters and grandkids so I thought I would focus on something productive and set up my own craft room. Never was a possiblity before but now have extra un-used rooms. THANK YOU SO MUCH. You have inspired me with how creative and cost effective you are. WOW! Plus my husband will be so much more relaxed when I drag him to the hardware stores now rather than the home design ones. SUPER AWESOME !!!!!!!!!! I love how you have used innovative ideas to store so many things. Like the french drain pipes or that granddad's ruler to uphold pictures. Your an amazing woman with super fantastic creativity. You have inspired me with so many ideas, although my craft studio is not even half as large as yours. Three words - Gee - Nee-US!! Love. love. love!!! I think that room is completely inspirational. How not to make amazing projects having such an atelier. I completely felt in love with each of the details.. This was so amazing! I can't wait to get my own craft room... for now it just takes up every inch of the east side of my bedroom haha :) thanks for your post! This is seriously the best craft room tour ever. I feel like I'm in the room. Whenever I see the craft rooms I always wonder about one specific thing they didn't mention, but I love how you covered it all and gave links to the posts about them (many of which I clicked on!). I am a detail person, can you tell?? Your craft room is unbelievable! It is the most ingenious and clever use of ordinary materials I have ever seen. I wish you could come organize mine. (which would be a lot simpler because I mainly make cards and scrapbook, not a lot of sewing) I just became a follower of your blog. Maybe you'd like to check out mine, some of my card are kinda cute. WOW!!! Now that's a craft room. Gotta admit, I am very jealous. Thanks for all the great ideas and inspiration. very impressive. i love your room and i dont even do much sewing. can i have some of your energy. i have about 15 projects started and NONE finished. Oh how I wish I had a room like this. But alas... I picked my 4 kids over a room instead. (darn it hee hee)It is just perfect. I'm just setting up a work area/sewing area for my new business (custom sewn musical instrument covers) and I have no money, so I'm trying to be creative and resourceful with what I have lying around. Your sewing room is magnificant! Thank you SO much for sharing the wonderful pictures as well as the ideas & instructions! This has got to be the prettiest sewing room I have ever seen filled with so many wonderful ideas - thanks for the great post - you have inspired me! Just came by from Tatertots and Jello - so impressed by your sewing/craft room! I am inspired to organize my area!